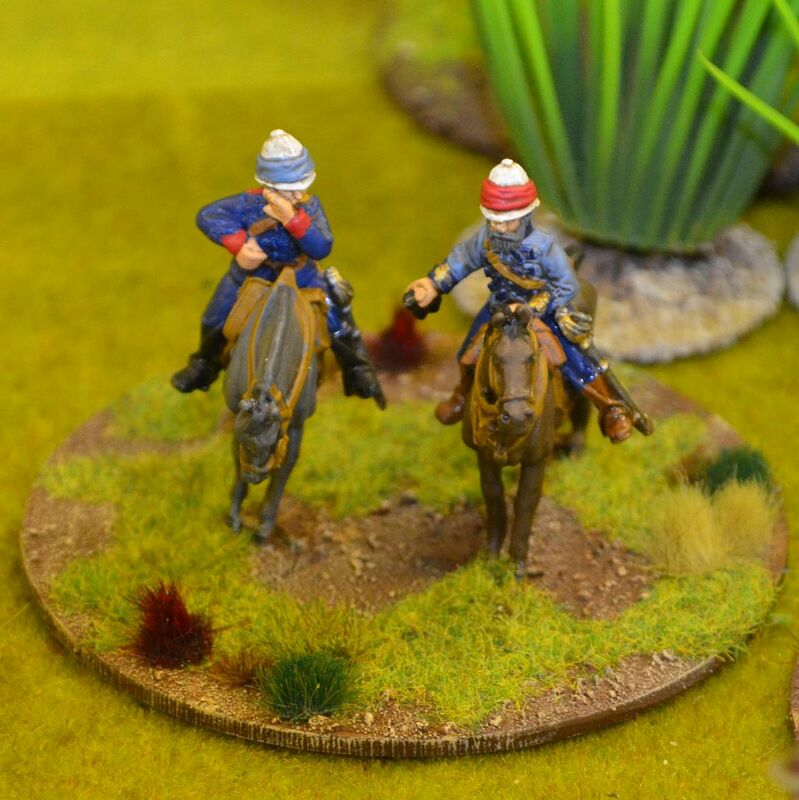 I finally finished off my Artillery trains for the Zulu wars - I say trains because I have created two. 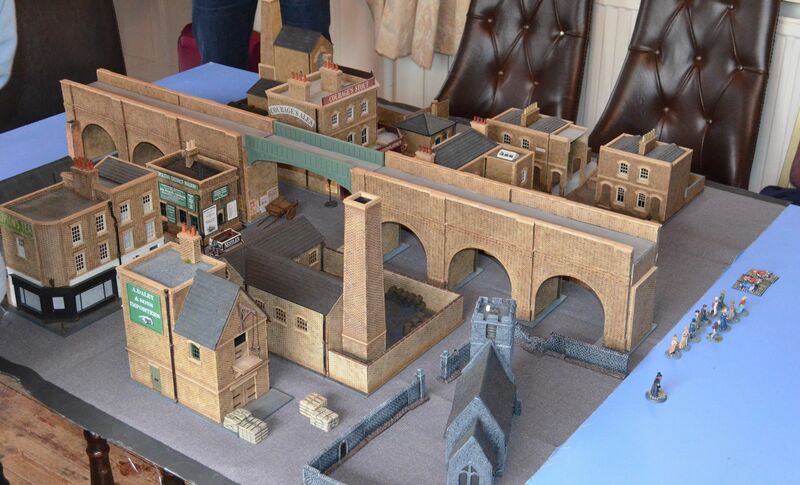 I originally ordered one set for c£27 from Foundry (this was their Boer War Artillery train) but when the goods arrived I noticed that they had provided a second limber frame by accident. A quick rummage through muy spares box found a couple of wheels and an ainsty resin chest could be glued on top of the limber for the seat (ammo caisson). When I saw the six horses provided they looked vaguely familiar and another search through my various spares bin found two more horses identical to the original six. I was in business. 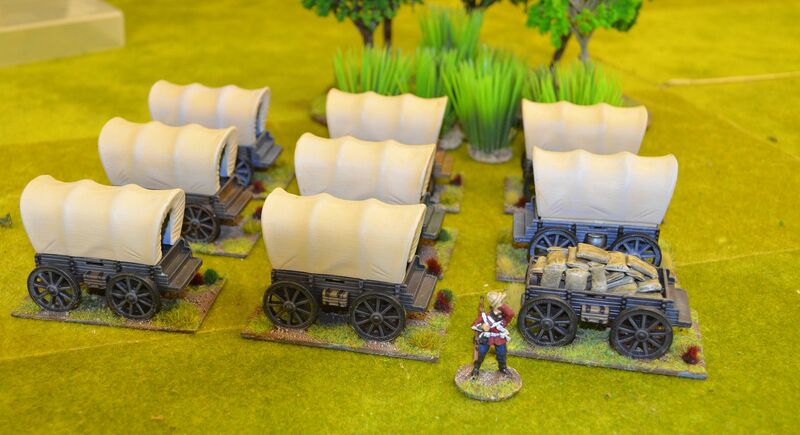 As part of the Zulu project I will want to set up some Boers versus Zulu games with a Wagon Train. The following idea cannot be claimed by me. 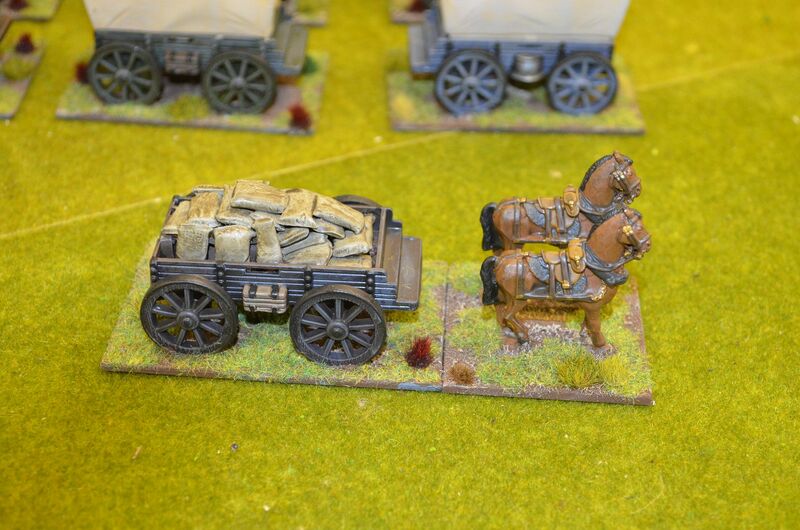 The first time I saw these wagons was on the rather impressive Upsheet Creek Cowboy board produced by Mason. Link below. 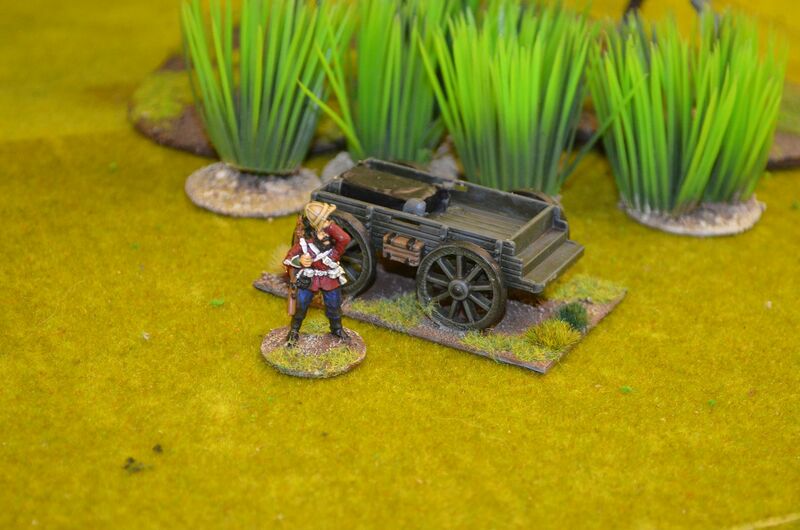 The wagons themselves are pencil sharpeners purchased from a company called Shapenking based in the Netherlands. I purchased nine of these (they didn't have any more) for about £4 each. These are diecast with the awning in plastic. This easily comes off. I filled up the 'sharpener' with some clay and etched in the planking at the back. The Marlboro logo just peels off. 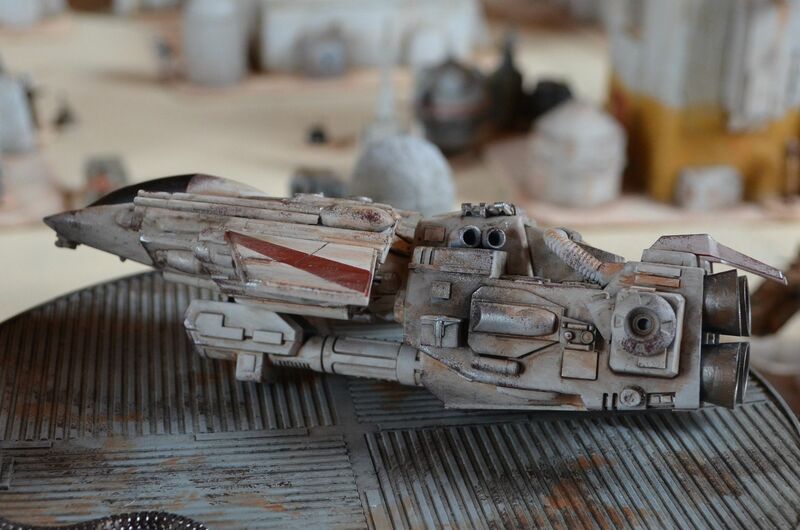 Painting these and mounting them on 2mm plasticard was a doddle. I have painted some in blue, green and browns. 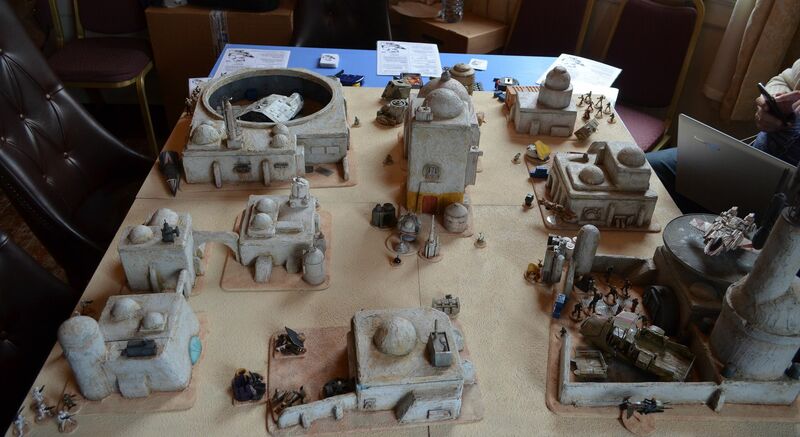 The awning were all painted in Iraqi sand and dry brushed white. 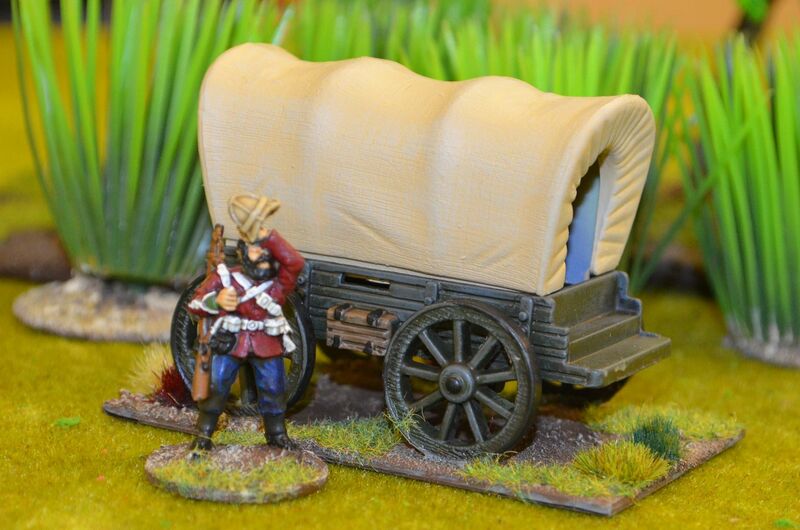 I now need to find some draft horses and oxen to pull these babies but I think they work well and are certainly cheaper than other metal wagons or the mdf versions out there. I was tempted to cancel Monday night's game given the news of my Fathers passing over the weekend but actually I decided to press ahead. Its what he would have wanted me to do and I needed something to take my mind off the events. 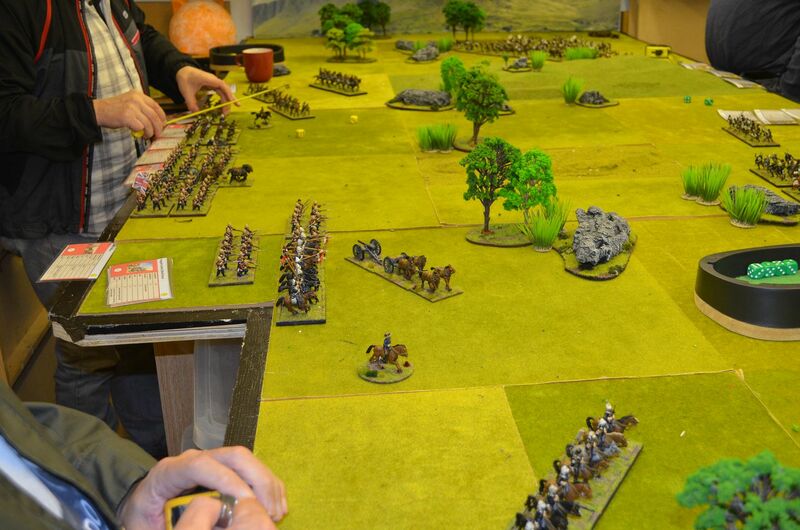 As reported last week we played The Men Who Would Be Kings and this week we would fight the same engagement (a straightforward pitch battle) using Black Powder rules. 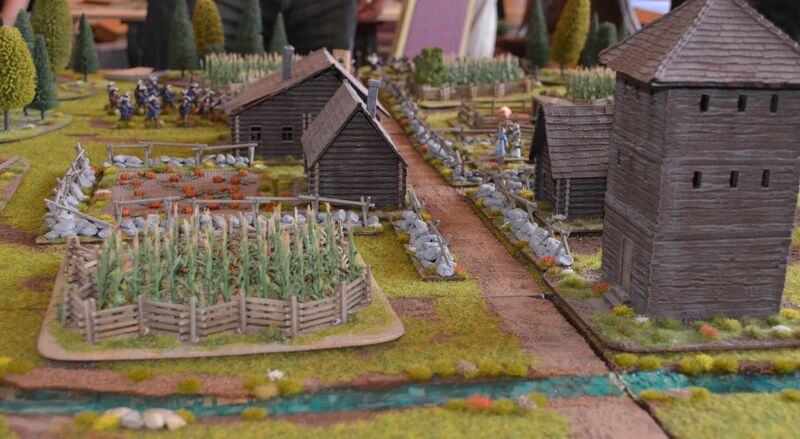 Interestingly the two players commanding the British had not been present in the previous game (which the Zulus won convincingly) so had no idea of how things were going to pan out. We agreed at the start that the first army to lose half its units (off table or shaken at the end of the turn) would be the loser. 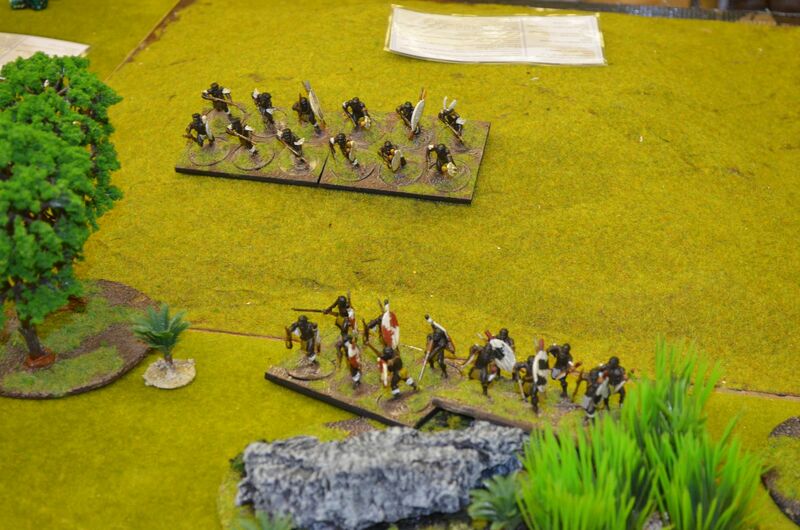 Both British commanders were aware of the Zulus victory in the previous week and felt once again the Assegai armed horde would triumph. I am not going to write up a battle report of this game but rather focus on the comparison of the rules, however suffice to say the British troops managed to get their lines of defence into order quite quickly and the decimating fire from rifle platoons, gatling gun and artillery severely dented any hopes of a Zulu victory.Indeed the British won convincingly losing only a couple of Boer units, the Sikhali horse, a gun battery and a rocket troop. The Zulus on the other hand were slaughtered. By the time the game closed (all played in a leisurely two hours) the Zulus had seen the best part of 10 impis routed from the table and a further 8 shaken. 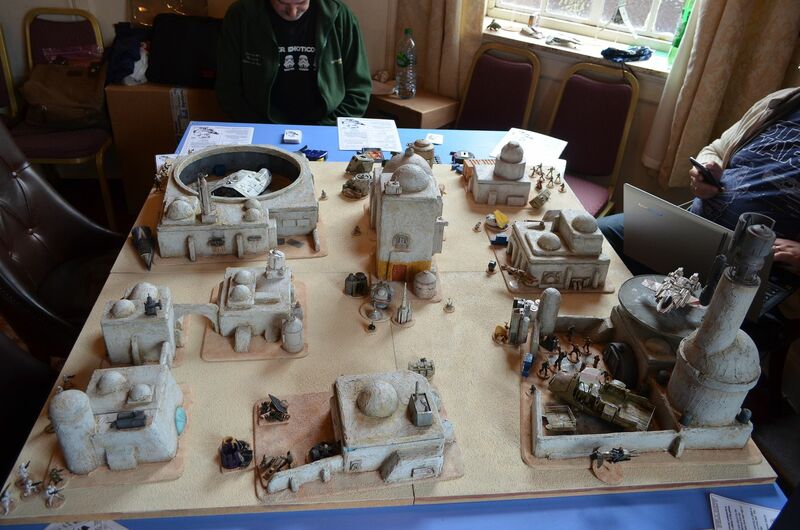 They had 28 units on the table compared to the 18 on the Allied side. 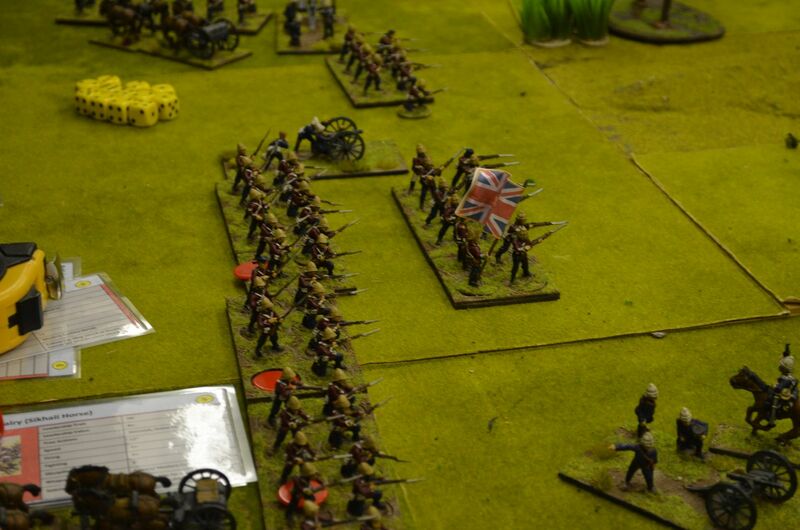 Only one of the British Infantry units (out of six) came close to being destroyed. 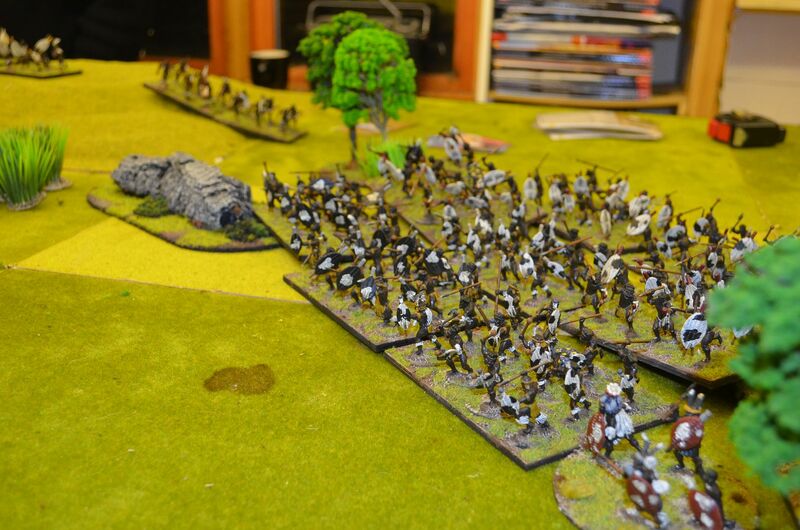 As a game Black Powder is very simple but does deliver big games in a reasonable amount of time, this in part down to the fact that individual figures are not removed but rather the whole unit goes from full strength to shaken once it comes under fire/ engages in melee. Shaken units effectively become useless unless rallied. With so many Zulu units suffering murderous fire their command just couldn't rally and press home other attacks in the same turn. 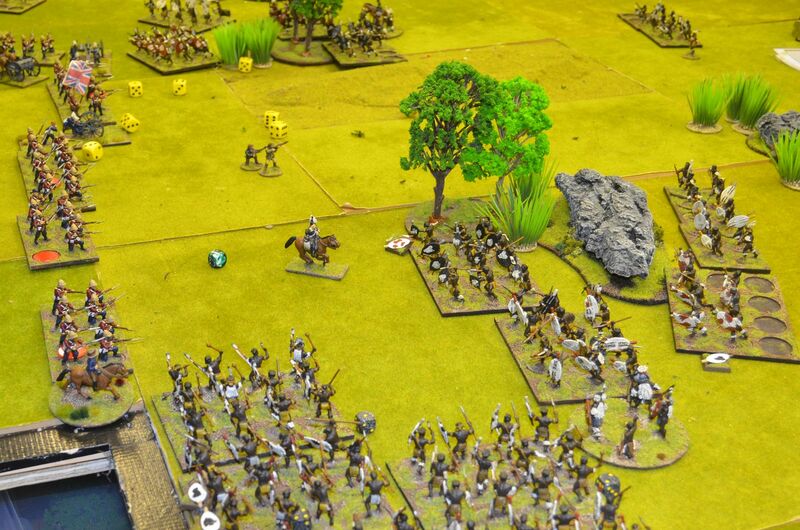 More commanders on the Zulu side might have aided them in this game. 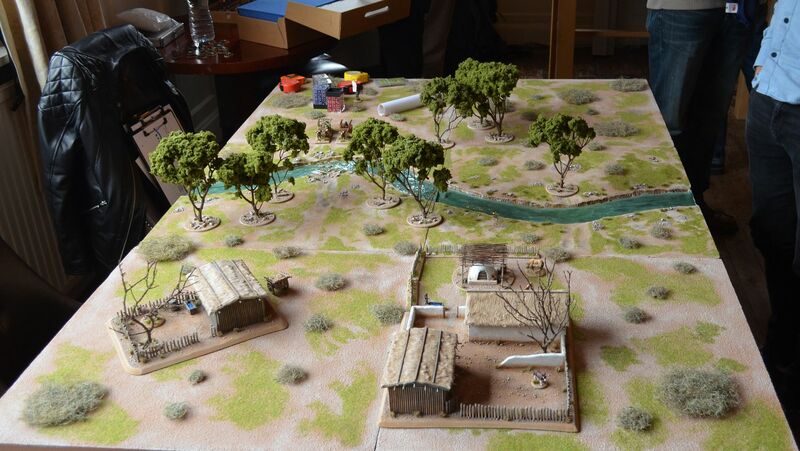 In both games the sight of hundreds of Zulus charging a thin red line was all we needed to capture that Zulu Dawn feeling (aided by the music and gunfights from the films played over the speakers in the shed ) - Both rulesets clearly demonstrated the devastating firepower of 19th century firearms against tribal infantry. I certainly felt that both games delivered. 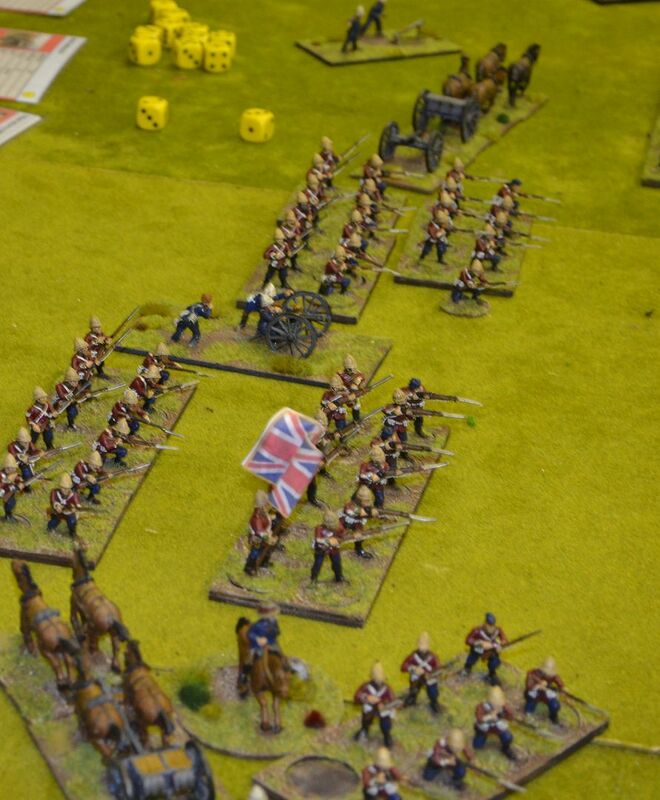 The British won the second game because they managed to form their defensive lines much quicker than in the first. 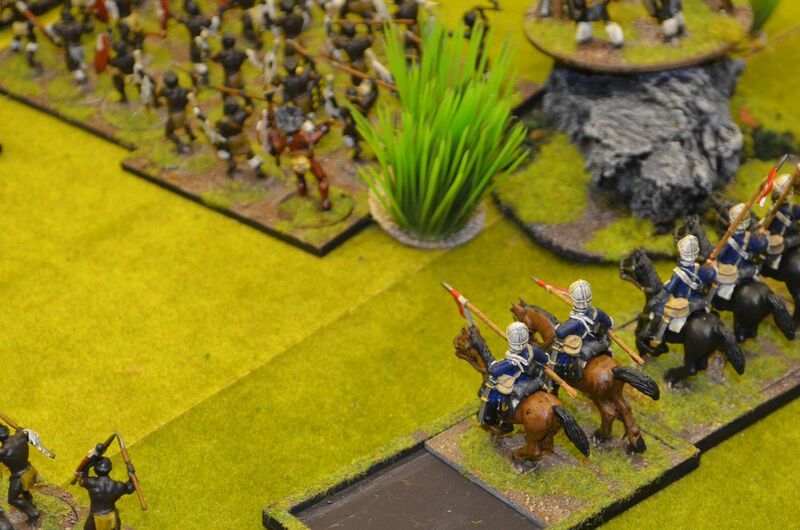 Equally in both games the Zulus targeted the weaker wings of the British army (The redcoats were in the centre) but in the second game the Zulus did not have the opportunity to take out the forward elements of the British forces. Question: Were the troops types able to do what we thought they could do? 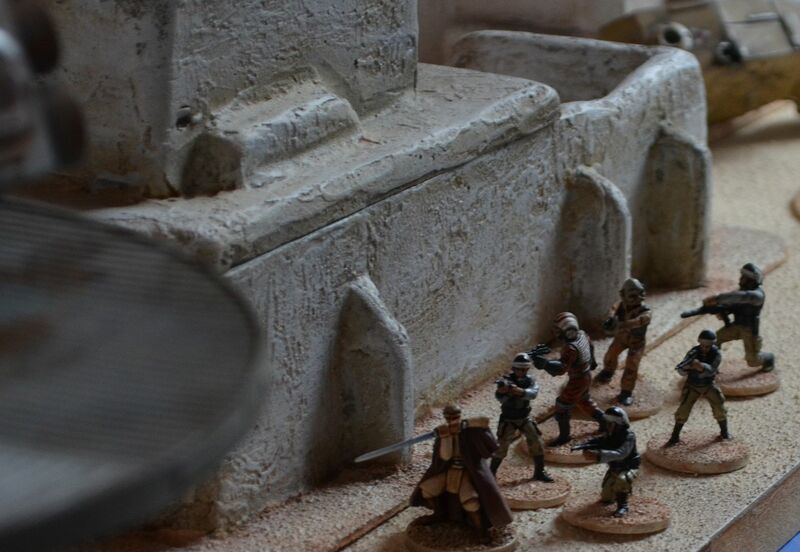 In my original post I lamented the lost opportunity of the TMWWBK ruleset for not delivering effective skirmish and evade rules. 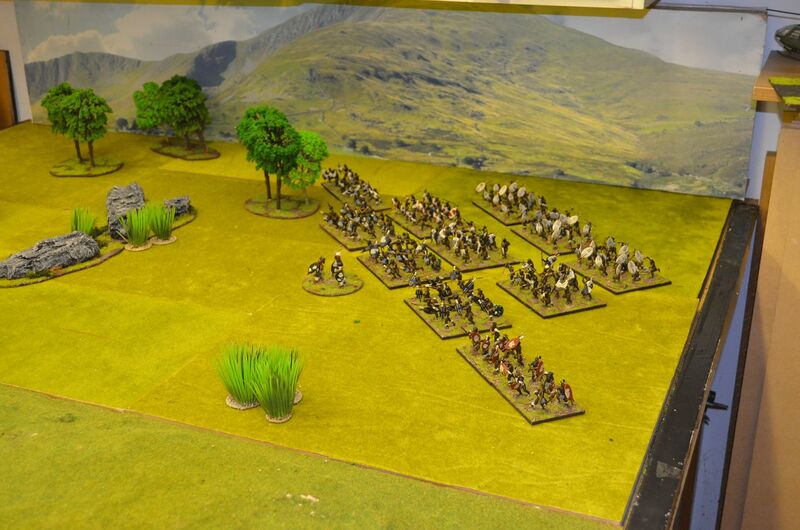 Black powder does and in many occasions last night Auxiliary horse were able to evade the charging tribals. 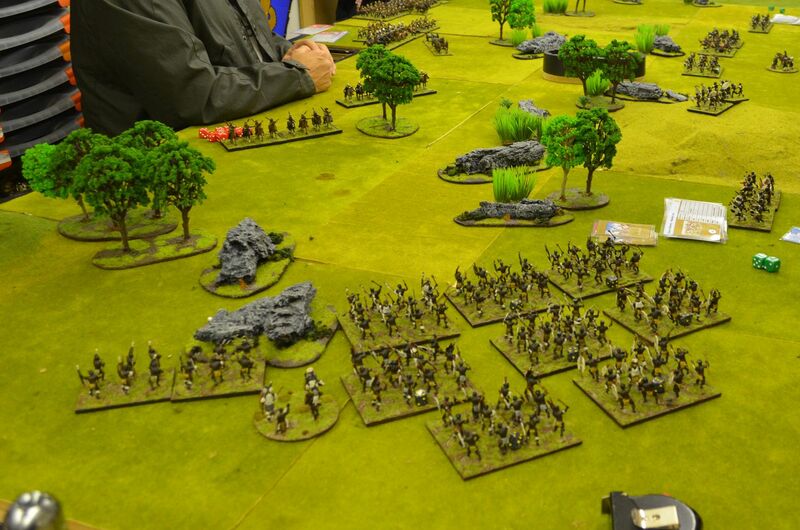 Close order infantry was devastating in both games 0- enough said and the artillery in the Black Powder game was far more effective at close range and yet less so at long than the TMWWBK set. 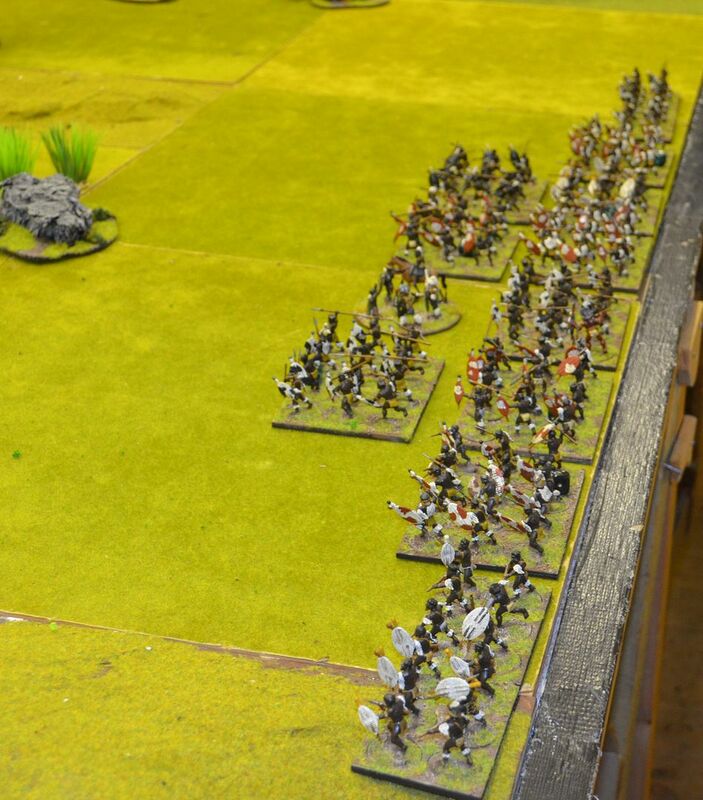 In summary I felt the Black Powder ruleset worked better on this point. Question: Unit activation - which works best? 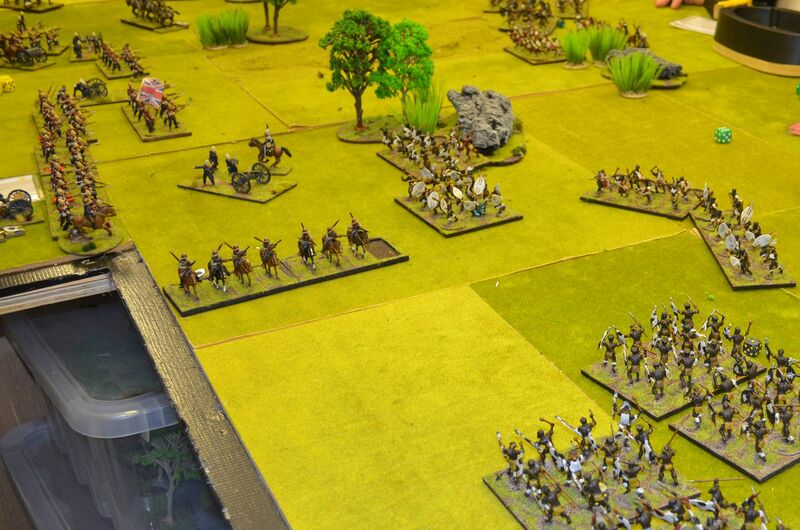 We used the optional rules for the AZW period in Black powder in as much as all Zulu Units can move at least once (similar to the free move in TMWWBK) and unlike TMWWBK all units could fire. 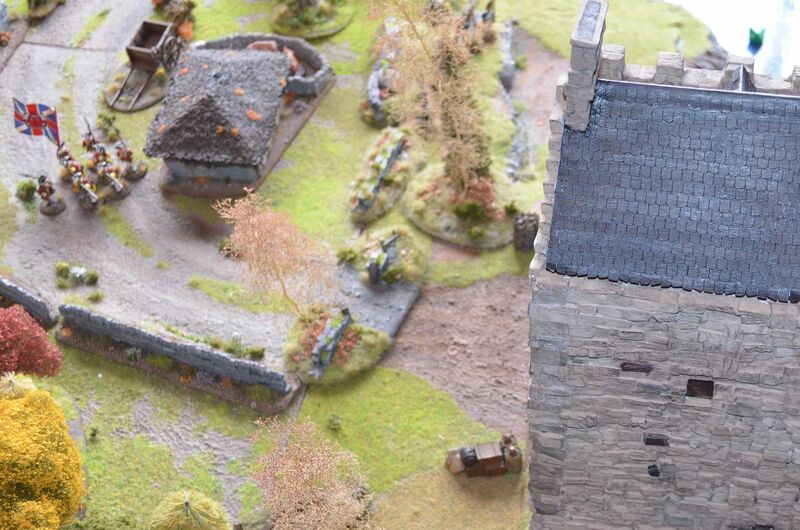 This clearly aided the British auxiliary forces, we found that the Boers to continue to fire every turn. They did not in the previous game where they died to a man. However Black Powder, with only a limited number of leaders does mean a failed order stops the progress dead. 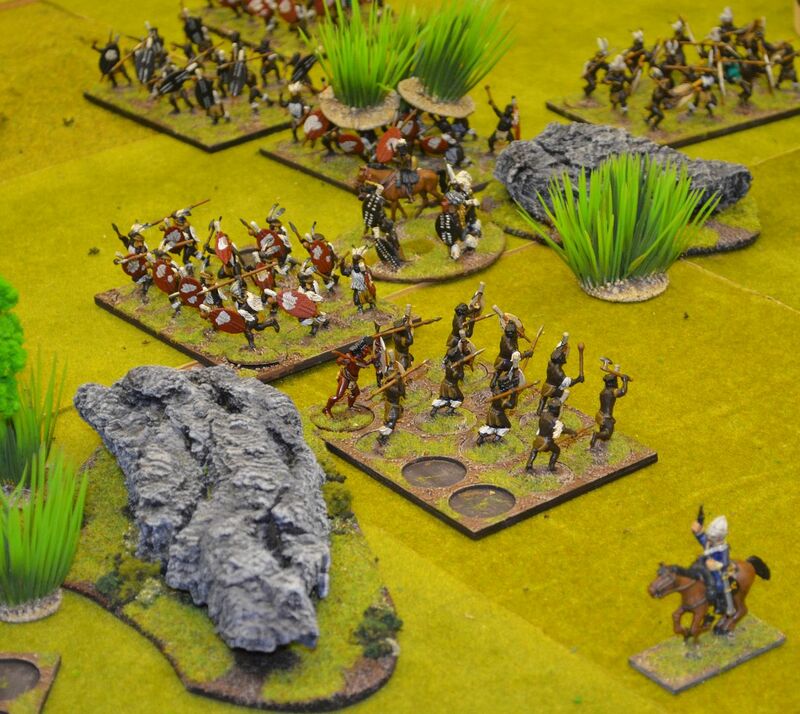 Zulu units could move but could not charge unless in initiative range. Whereas TMWWBK rules allowed every unit to perform its own action. Question: Were combat resolutions fair? These rules are very different. 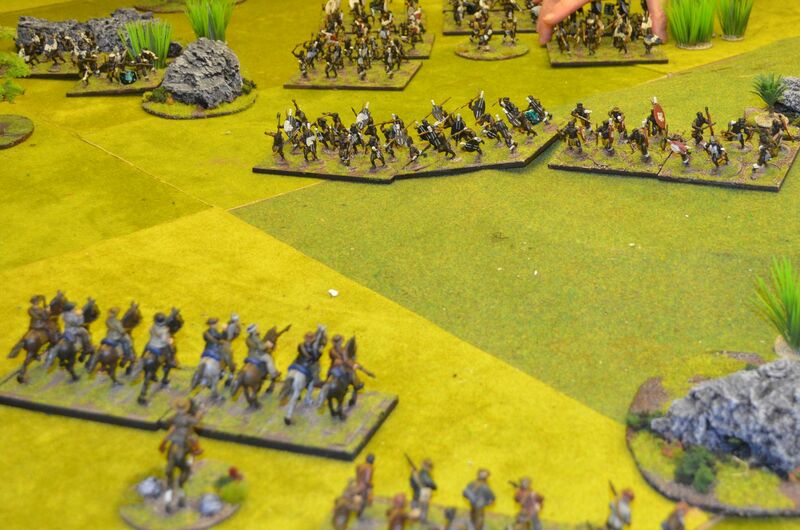 Black Powder focuses on the units rather than the figures with for example a British Regular unit firing with 4 dice against a target with circa 3 hit points. It is conceivable that if all hits are made and saves failed the unit could disappear. 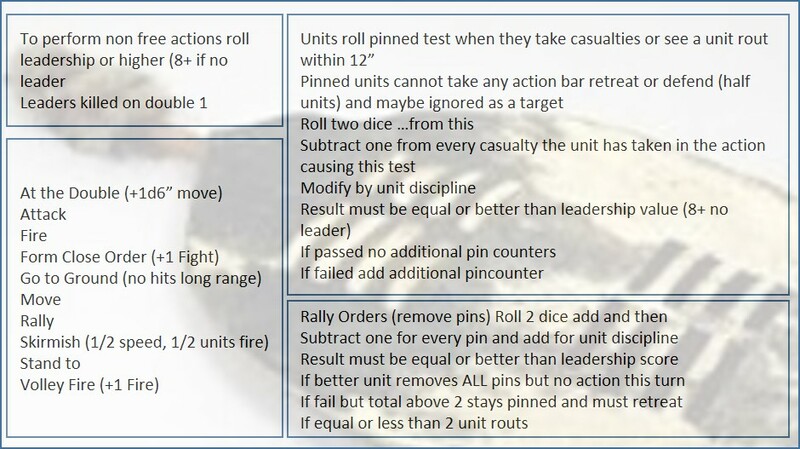 TMWWBK calls for all figures shooting/fighting to roll dice and then saves to be made. 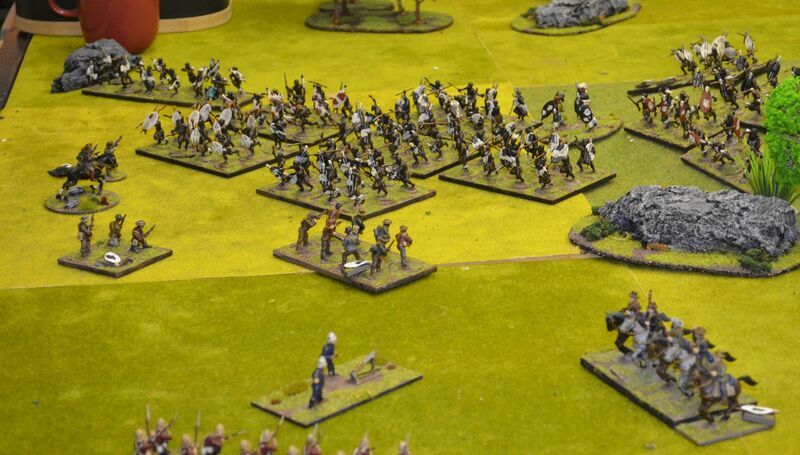 Units tend to last longer in TMWWBK but clearly their strength diminishes the more casualties taken. Dices scores required tend to be very similar. 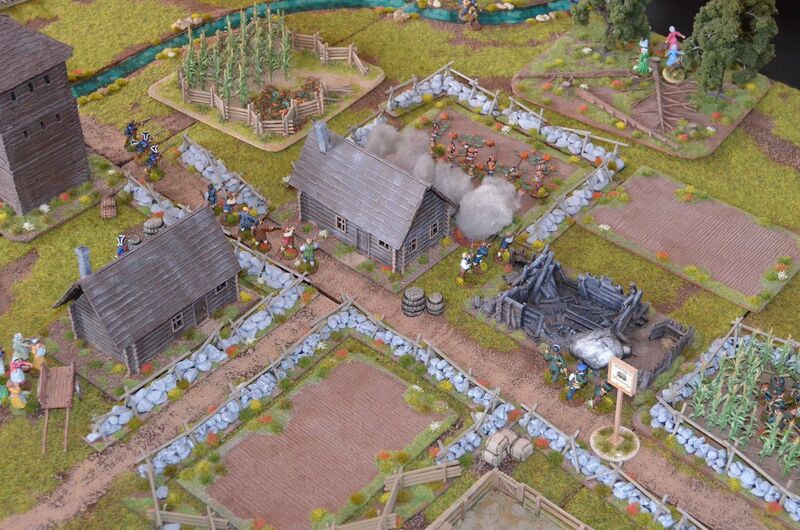 Black Powder has one big thing going for it in mass battles - with no casualties removed the playing area is much tidier and it takes less time. Question: Did Game Mechanics hold up play? First up Black Powder is designed for mass battles whereas TMWWBK is aimed at a much smaller engagement - grand skirmish I think is the term. My comparison is based on as big battle and in this case the TMWWBK held up really well but there are some amendments I would impose (see previous post). 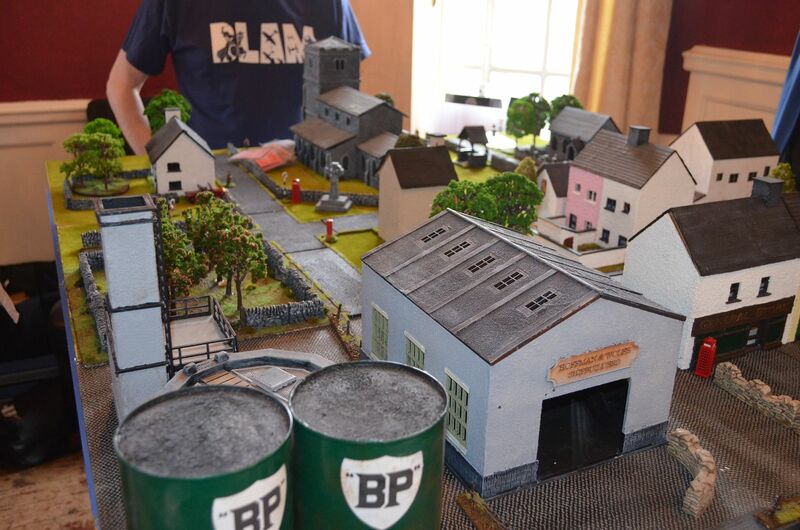 Both games delivered an exciting battle although the BP version delivered a much clearer result earlier on using exactly the same number of units each side. This may in pat be down to the balance on the table or the tactical geniuses throwing their dice - I don't think we will know. I for one will continue to use both sets of rules as I see fitting the engagements we play. Next Up: We are going to park the Zulu Wars for a bit now (whilst I finish off the iconic Rorkes Drift) but will return to this period before the year is up. On Saturday Night my father David passed away peacefully - he'd been diagnosed with a brain tumour a few days after we visited the battlefields of Agincourt and Waterloo back in May of this year. Looking back on that weekend there was no sign of his illness or what might follow in the coming months. It was a fantastic weekend and serves as a fitting memory to all the positive times I had with my old man. 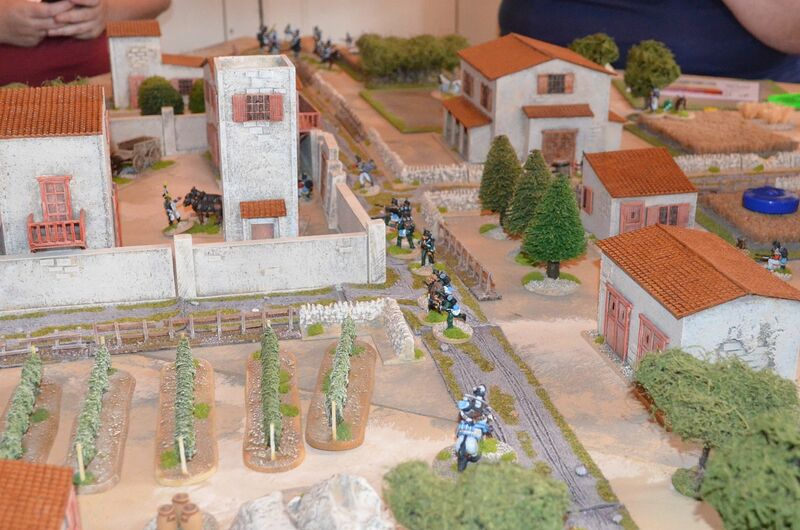 I decided that I wanted to honour him on this blog because without his passion for military history and toy soldiers I would have never discovered this wonderful hobby. There is no doubt that thee will be many kind words said about him in the industry that gave him such a wonderful and fruitful career and he will be sorely missed by my mother, my brother and his family and of course Shedwife, Shedson and Sheddotte. 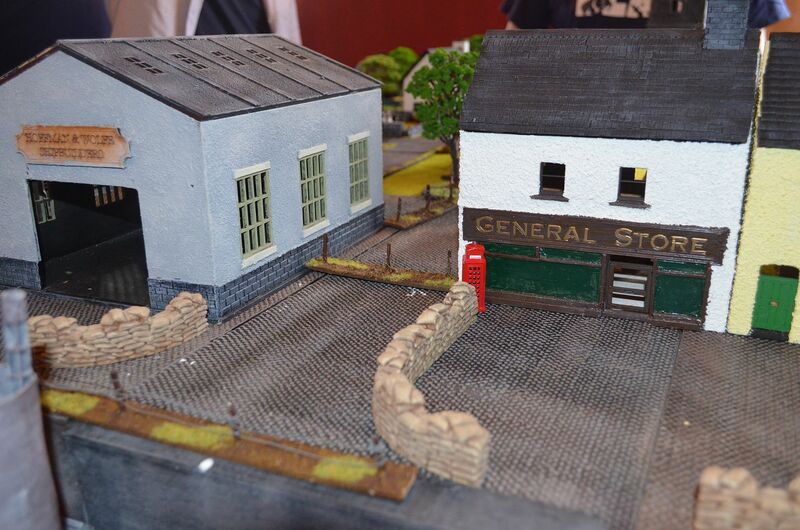 Indeed he is not only responsible for introducing me to the world of military modelling but also many of the practical skills that have enabled me to build not only the existing Shed but also all the terrain we play on. I remember fondly that he allowed me to use his tools whenever I wanted on the proviso that they were always put back after use. This self learning inevitably ended up in hospital with various cuts and stitches. His practical skills were honed in the theatre. For many years he took the lead in stage management and set design for the local amateur dramatic pantomime productions. Throughout my childhood my brother and I would be dragged from our beds on a Sunday morning to wield paintbrushes on large stage canvases or climb perilous heights to fix leaves to giant beanstalks. His garage/come workshop, was filled with stage props from shields to swords and even complete sits of armour constructed from drain pipe plastic. It was a wonderful world of imagination and creativity. He taught me how to fish, to enjoy a good malt whisky, appreciate fine foods and good wine. He introduced me the world of Sherlock Holmes, fictional history, starting with Bernard Cornwell, and a wealth of contacts and associates on which I could build my career. We had some fantastic family holidays including visits to all the castles in Northumberland, a trip to California (where he was arrested on the freeway for driving too slow), and a wonderful time in the Emerald Isle. He was a great raconteur, a most generous host and a loving husband, father and grand father. He built the first Shed - a large cabin in my folks garden where our very first wargames were fought and hours would speed by playing Dungeons and Dragons. Like so many of his generation he completed his national service in the Royal Fusiliers and saw action in many parts of east Africa and the Middle East. He was proud of serving his country but when pressed never really spoke of his time in the forces. 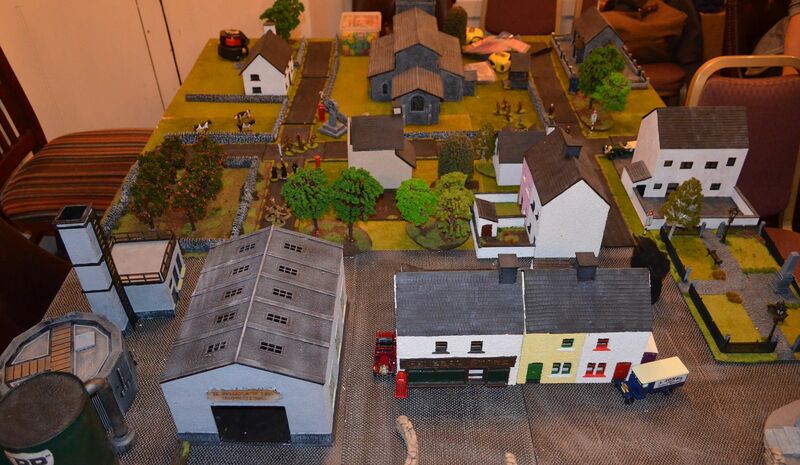 Although he never took part in a wargame ( it is a regret that I never really asked him) he painted 54mm figures to a good standard and many of these are displayed on view in the family home. He was absorbed in military history and had an indepth knowledge of the British wars from 1815 to the end of the colonial period. Of all the historical genres the Anglo Zulu Wars was his favorite. I remember fondly going to see Zulu in the cinema in the 1970's and when I had the opportunity to take him back to see the film for its 50th anniversary screening in Leicester square there were tears in his eyes. In the few weeks before he passed away he watched the same film again with his grandsons just like my brother and I had done so many years earlier. The Zulu film was instrumental in our household procuring its first video tape recorder in 1979, when we discovered the film was to be shown at Christmas that year on the TV we badgered him to get hold of a machine so he could record it. Perhaps it is fitting that we have chosen the music of this film to be played at his funeral. 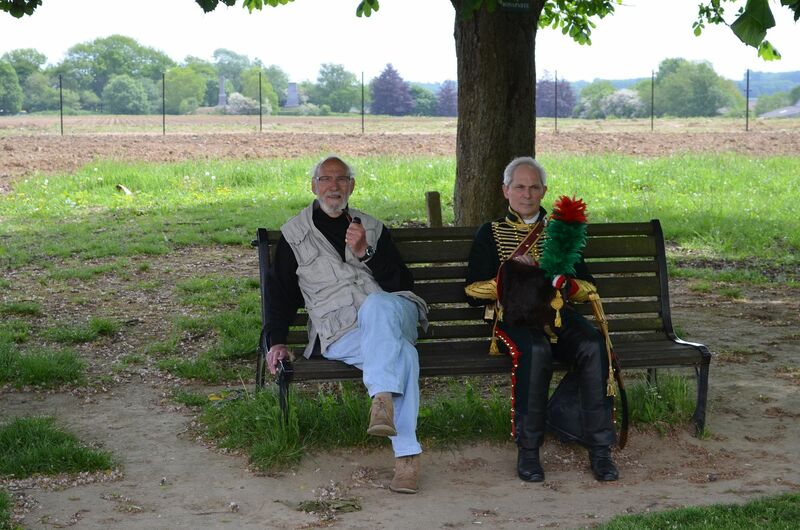 I had hoped to complete my Zulu Wars project before his passing and as he detiorated I would talk to him of the units completed and those to be done. Sadly he'll never see the finished article but every time we play using those red coats and assegai armed warriors I'll remember him. As I complete this very personal obituary I realise that I owe him so much and that mere words cannot do justice to the the wonderful father and great friend that I have lost. 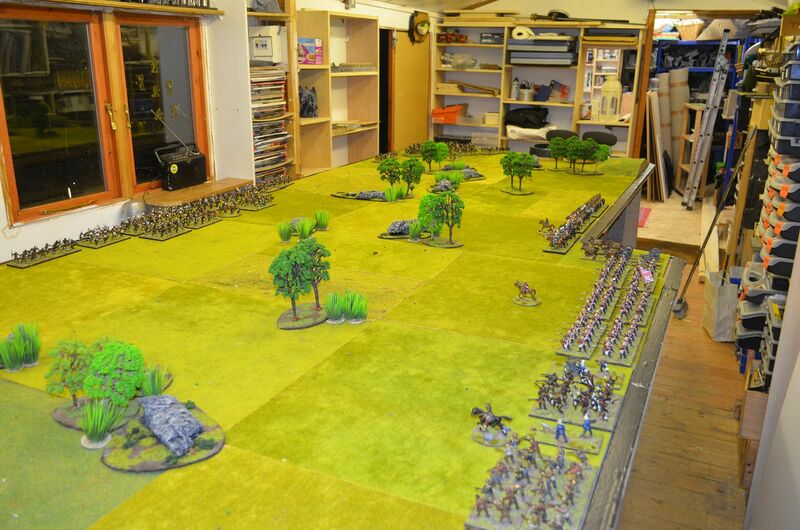 Monday night saw the Shed packed to the rafters with gamers, zulu's and redcoats. 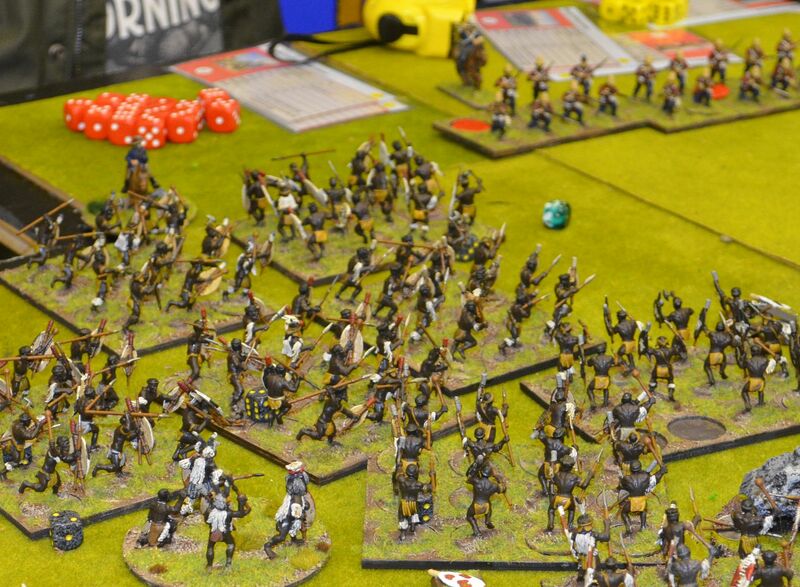 Following the success of our first Anglo Zulu wargame using Black Powder it was our chance to try out the The Men Who Would Be Kings ruleset. 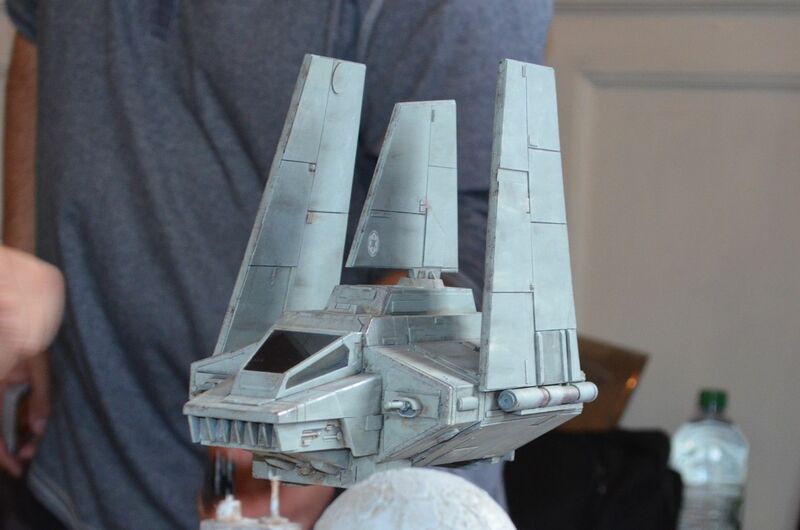 This post is quite long - and contains the best part of 40 photos. 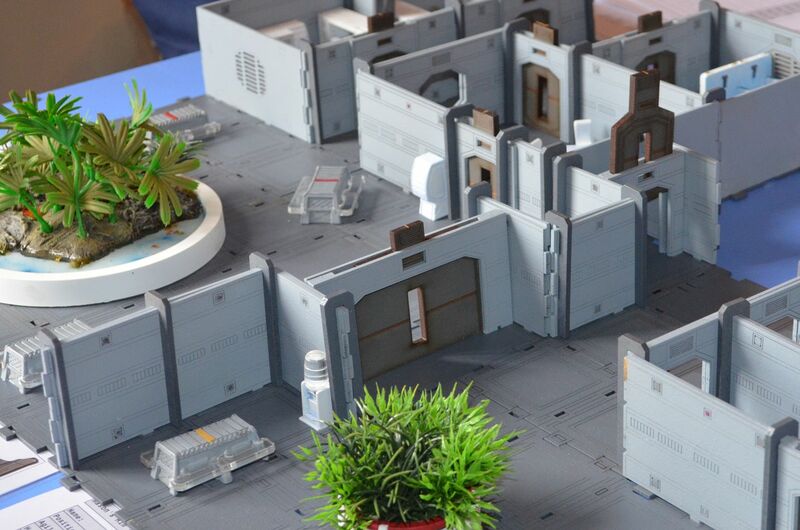 Right at the end is a critique of the ruleset. With six players (including myself) I decided to throw a fairly large extravaganza using most of the troops I had available. Tonight would determine if I need any more big units for this period. The unit cards prepared earlier (listed in the post before this one) would be used by all the players. 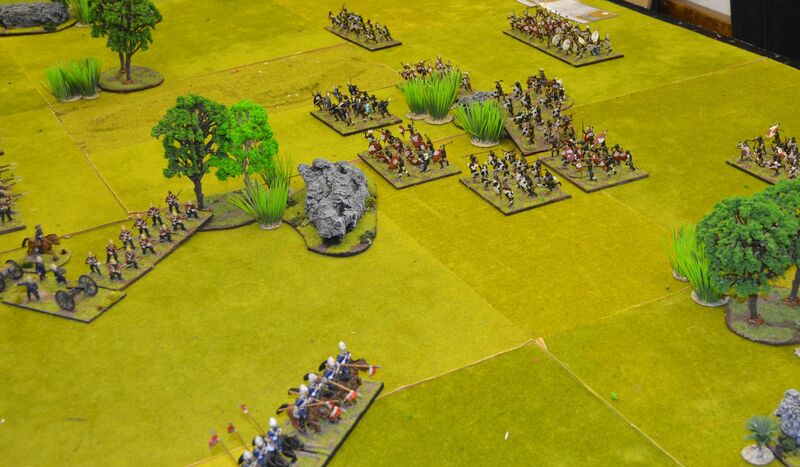 The forces were quite straightforward and as you see the Zulus are about 50% stronger than the British Force. This will be a good test to see if the points system listed in the book work. 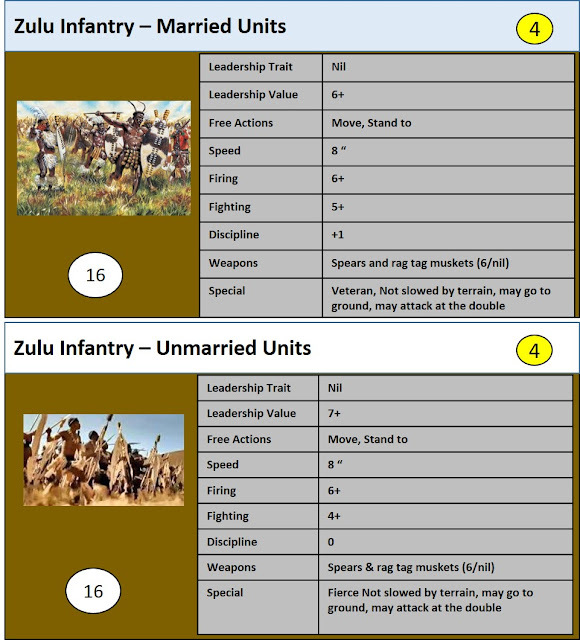 The Zulu units are based in 12's and should be 16 strong. 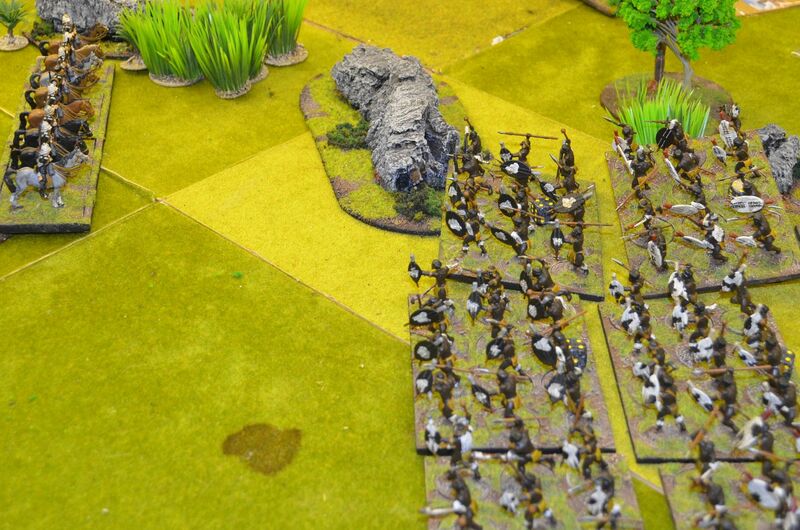 So rather than reduce the size of each force the Zulus all have a small dice which will denote the first four casualties taken. Each brigade has a commander who can influence a unit within 6"
We were somewhat surprised that no rules for rockets were given in the book so we developed our own. Rockets have a max range of 36” and a minimum range of 9”. 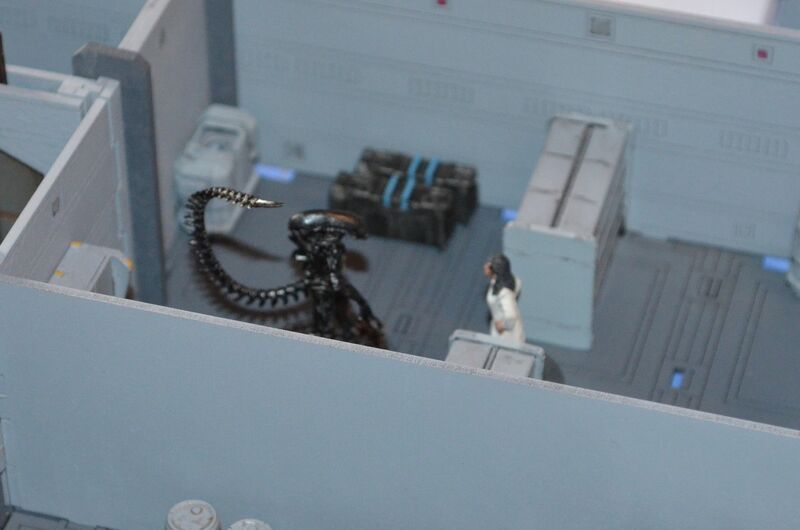 Each rocket troop has six die for firing needing sixes to hit. Any six that hits is a casualty and automatically disorders. As the hordes of the right wing advance.. They begin to mass for an attack on the british line..
A second victory for the Zulus - they did have 50% more points and probably needed it. Had the forces of been matched they would not have won. 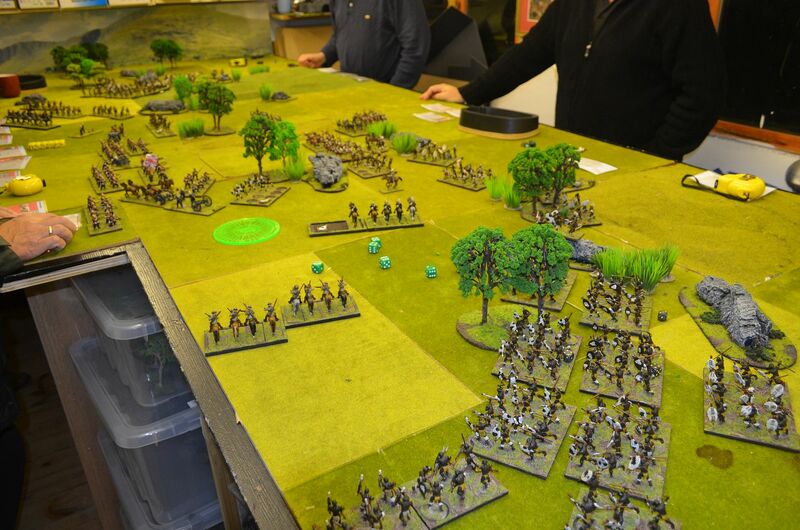 So how did the rules play…..
First up it is probably worth mentioning that with five players I decided to break each force into a series of commands (two on the British and three for the Zulus) – each player had an activation card which were revealed as the turn progressed. 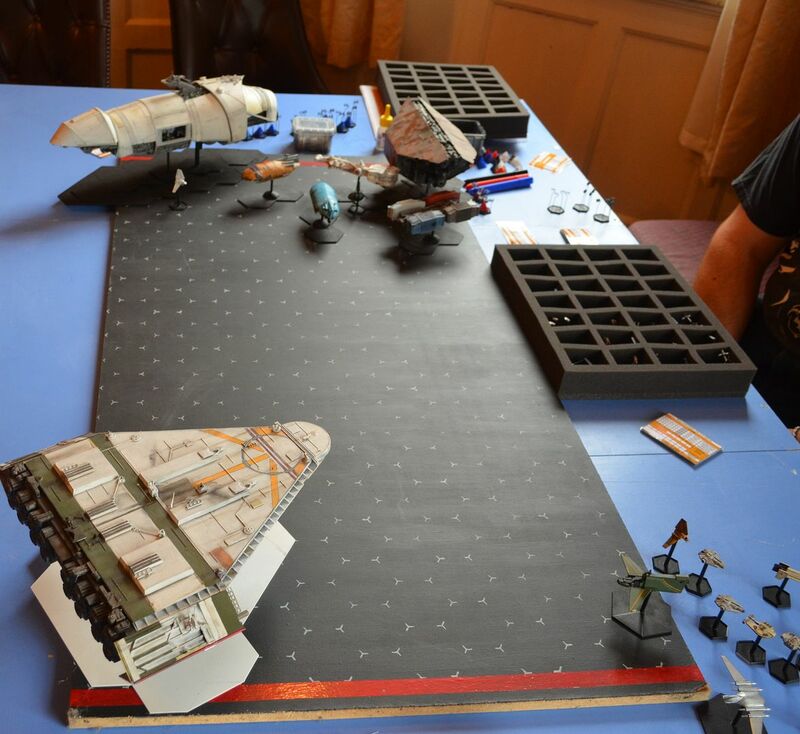 This inevitably had some influence on the proceedings and it may well of been possible for one unit to activate twice before the other opponent took their turn. Example Turn 1 – Player Order 1, 2, 3, 4 ,5 in turn 2 the order was 3, 5, 4, 2, 1 – this illustrates that player one would have had his turn then waited for every player to have had two turns before his second activation. The idea of these ‘random’ turn orders was drawn from the ruleset for multiplayers. Personally I am not sure that this works for this period and had we adopted a simple IGOUGO Approach the game might hasve been very different. Let me explain further. TMWWBK is a very basic ruleset – a unit can only do one thing in a turn (unless it is skirmishing) and does not react to the enemy moves unlike other rulesets for this period. 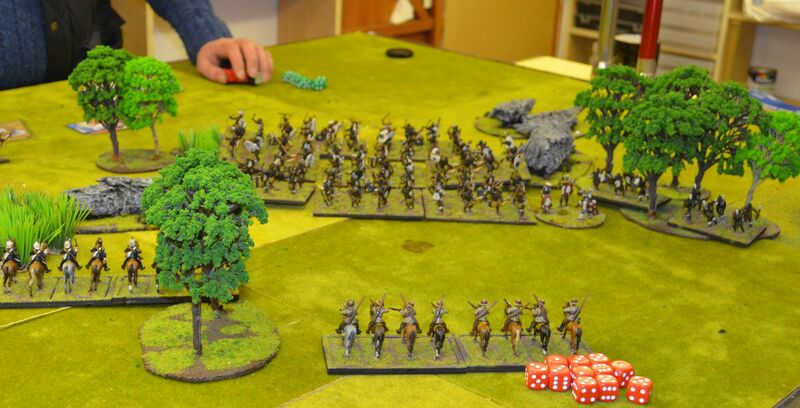 For example cavalry are unable to evade charges and regular line infantry get no fire on incoming charging troops. If we take the turn order as described above and assume player 1 controls the British Line and player 5 is a zulu impi, the number five player might have traversed the ground before the British line has even fired. There is no provision in the ruleset for even holding your action to be used as a reaction. 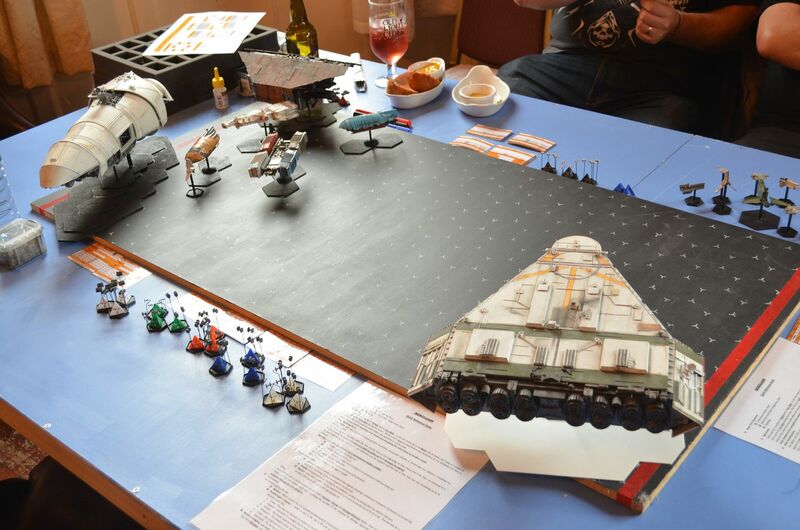 Furthermore there appears to be no penalty for choosing certain actions - whether you order to fire, move or move at the double they all require the same score on the dice. Inevitably all the players moved their troops at the double when they needed the movement as this order also gives you an attack option. 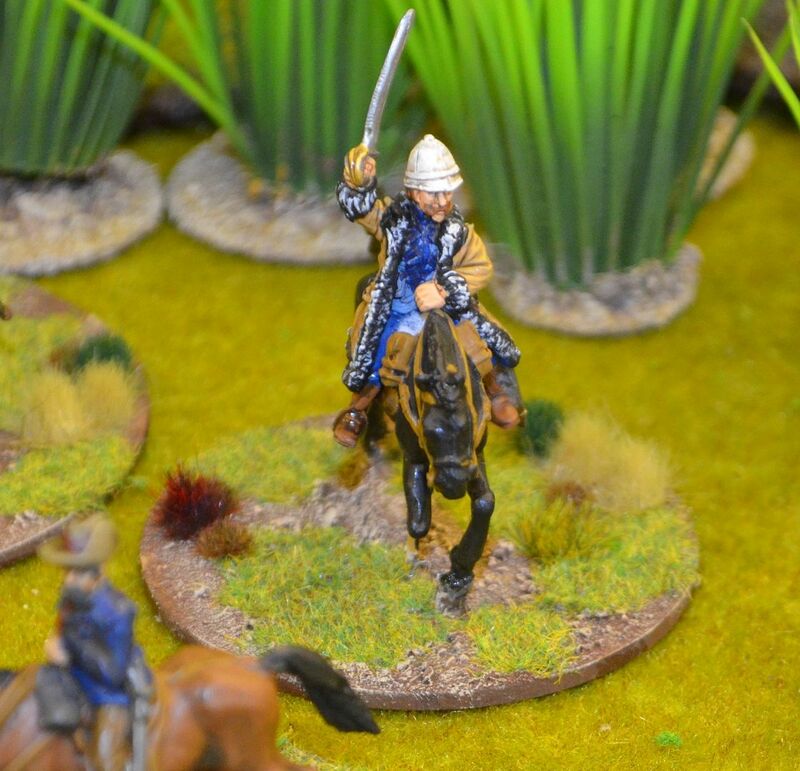 A number of the cavalry units in our game were given skirmish capabilities as their free action (Sikhali and frontier light horse) – this felt appropriate for the troops in question. 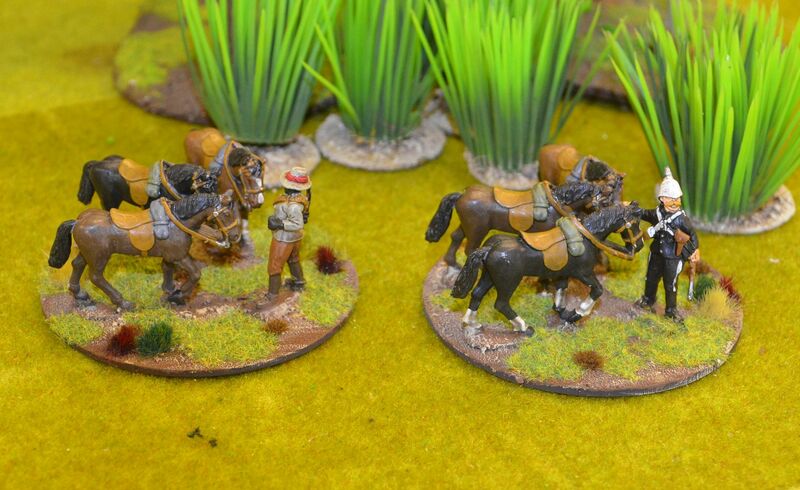 They had the speed and the limited firing capability but on at least two occasions these horse were unable to retreat from the massed ranks of Zulus. Indeed failed orders meant they could not even move. One suggestion might be to give ALL units the free action of retreat away from the nearest enemy. This would allow cavalry in part to escape hordes of unrushing tribals. 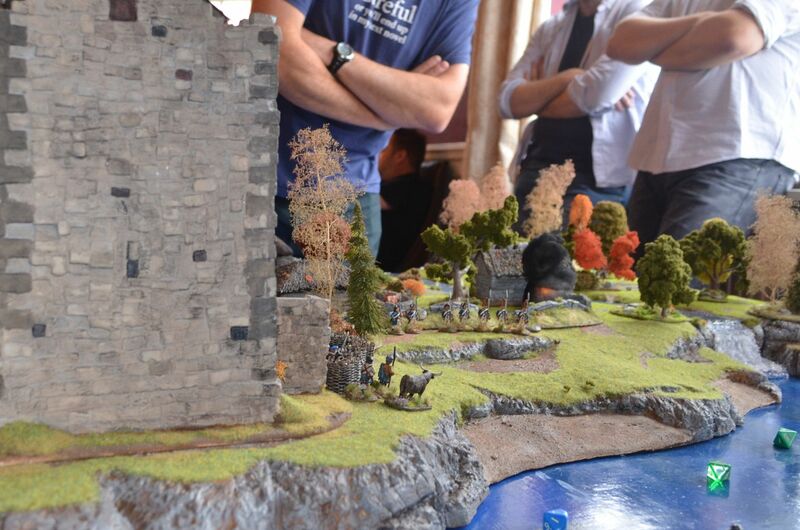 I need to go back to lion rampant to see how evades are treated in that rule set because this is a crucial element of the game. Something else was discussed but did not actually occur was the issue of counter charges – like evades there are no counter charge rules. I mentioned above that there is no provision for closing fire (unless of course I have missed this) – again this appears to be a big omission. 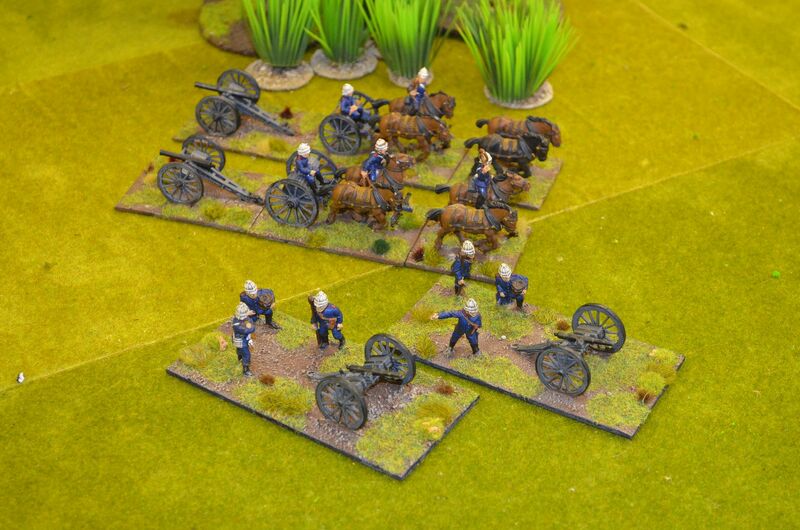 Regular infantry (indeed all firearm troops) should be able to deliver closing fire before a charge ploughs in. Perhaps this is best served with a leadership check and /or maybe only half the units fire. This leads neatly onto the impact of shooting/hits in melee. At present when a unit suffers casualties they must take a pinning test. This is completed by rolling 2d6 and from this total subtracting the number of casualities. 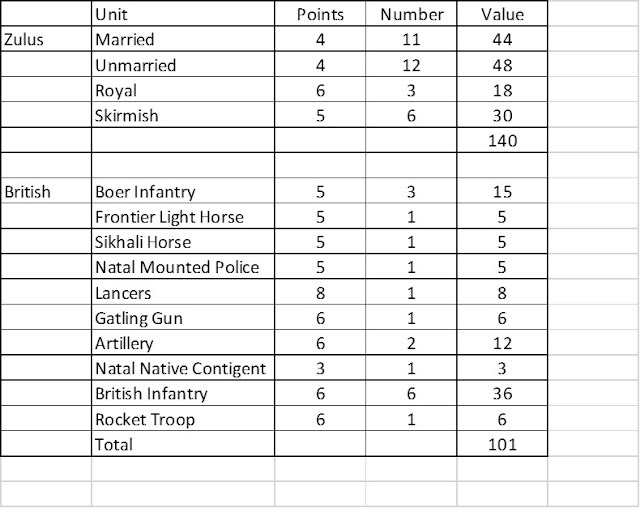 The result is then compared against the units leadership value. 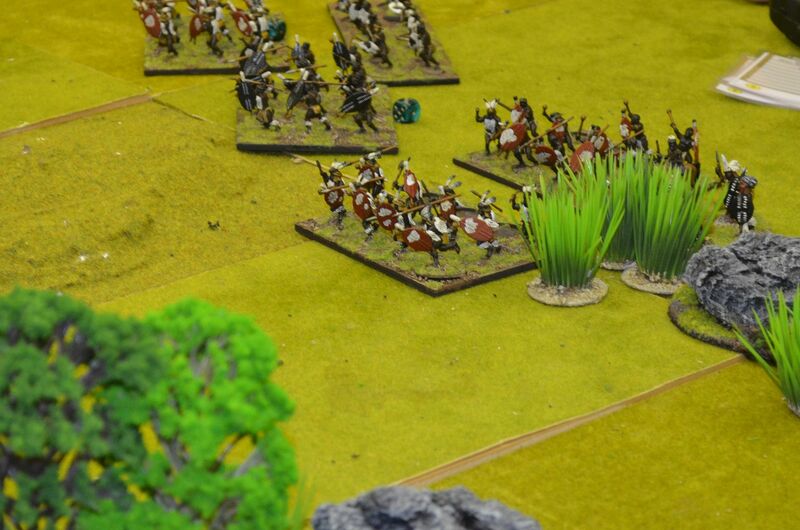 For example a Zulu unit suffers 3 casualties from incoming fire. 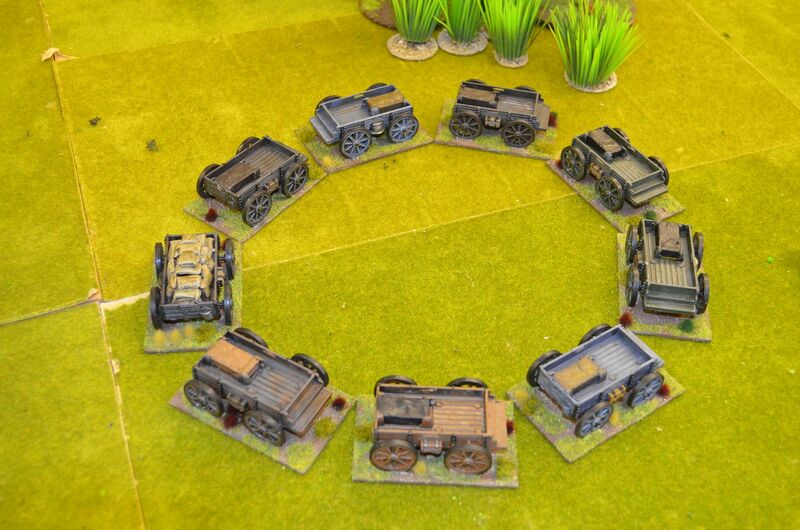 The unit rolls 2d6 and scores an 8 – subtracts 3 (for the casualties) leaving a score of five. Because this score is lower than his leadership value (7+) the unit is pinned and forfeits any actions until rallied. In principle this works well. Let us assume the same unit suffered 9 casualties from the same fire and rolled the same dice – the result is the same despite the deadlier fire. 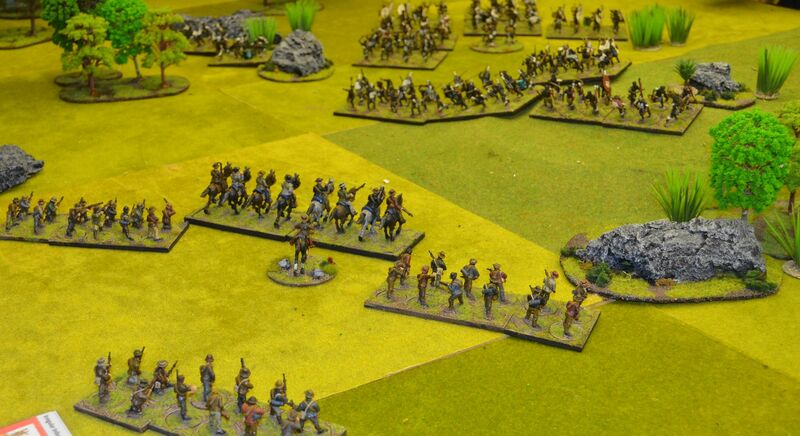 In the following turn the Zulu player tries to rally the unit – regardless of how many casualties suffered the rally result is driven by the number of pins. Rallying works similar to pinning except the only minus is the number of pins NOT the total casualties suffered. I think a trick was missed here in the rules. 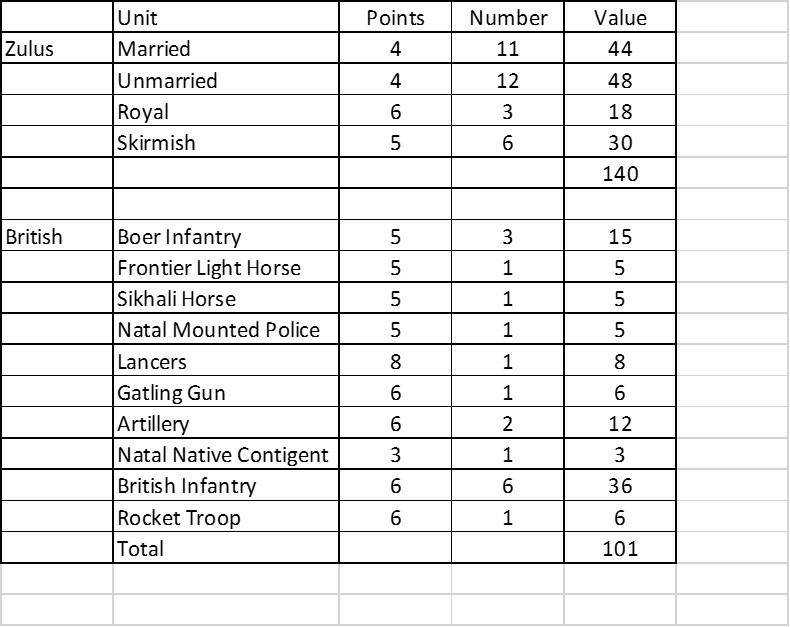 Firstly pins perhaps should be accumulated according to the % troops killed in the first round of fire – eg 1 pin for up to 1/3rd of figures in unit (remaining) and two or more pins thereafter. This would make rallying badly shot up units far harder and more likely to rout. Our problem last night was that we had a number of units left on the table rallied but with less than 25% original strength. 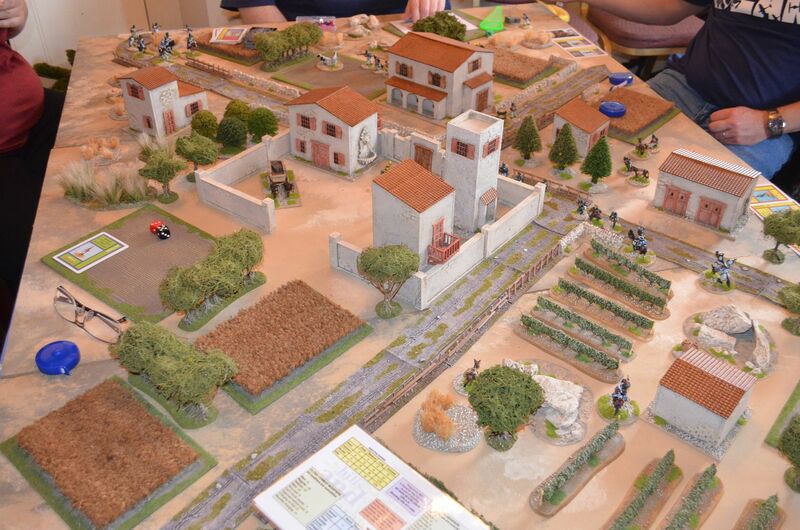 I appreciate the game is based on small skirmish actions and not the vast numbers we had in play. Melee is handled in much the same way as shooting for casualties (but using the units melee fighting skill) with only the loser taking potential pins. 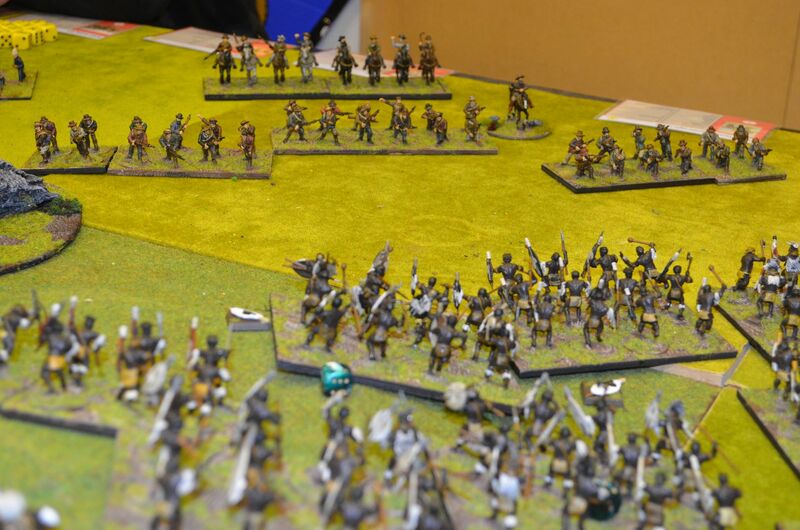 In one melee we had 12 regular line confronting a zulu unit. 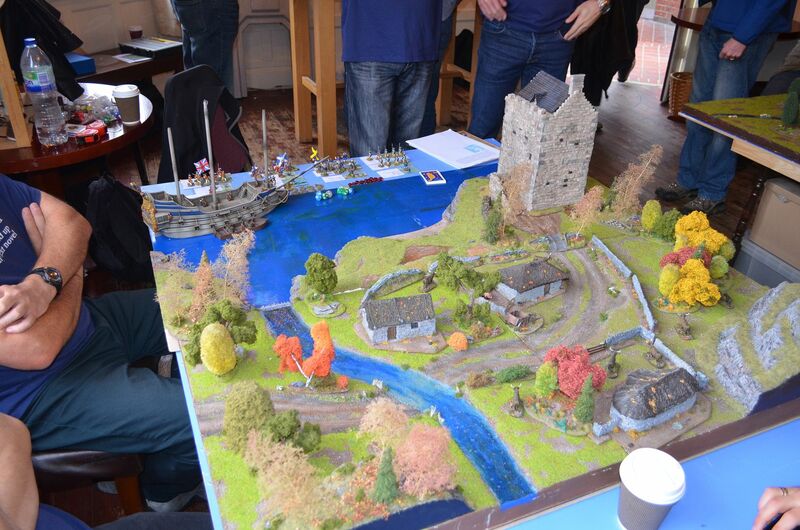 Both sides suffered over 50% casualties and neither side ending up pinned. 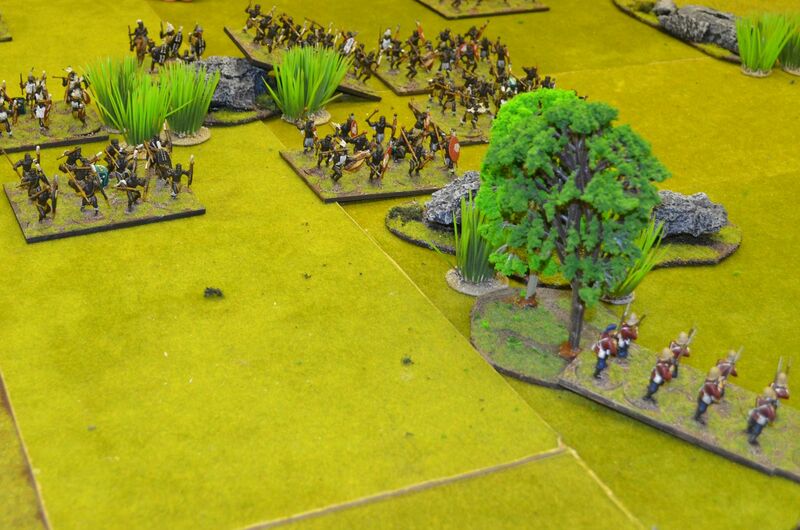 However the big missing point in the rule set is attacks to the flank or rear. 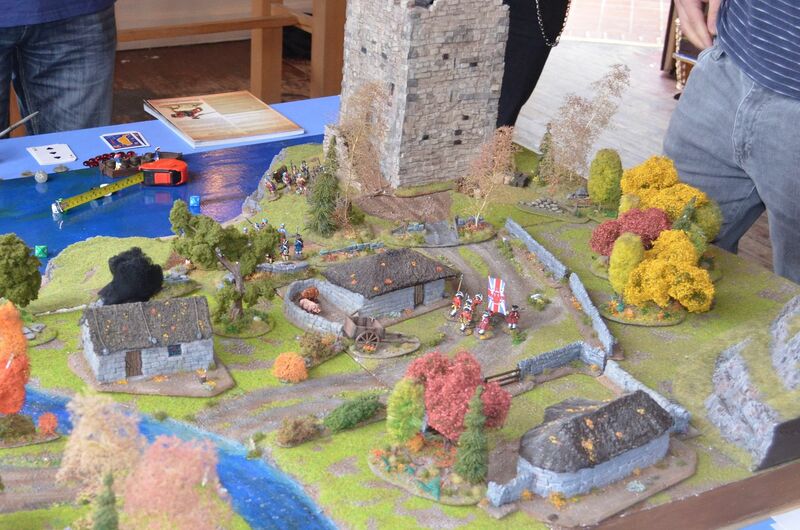 In evitable when you have formed troops, cavalry charges etc. 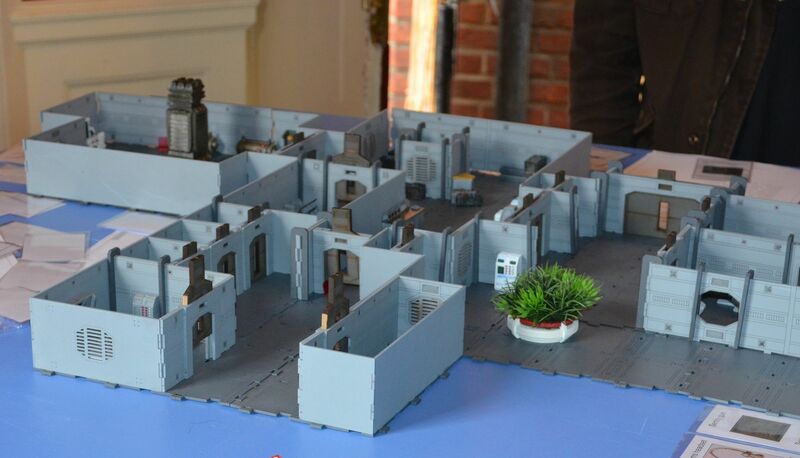 We introduced a simple houserule by saying that only half the units could fight if attacked from these quarters. If the above sounds like a poor review of the system I apologise to the author. This is not the case. 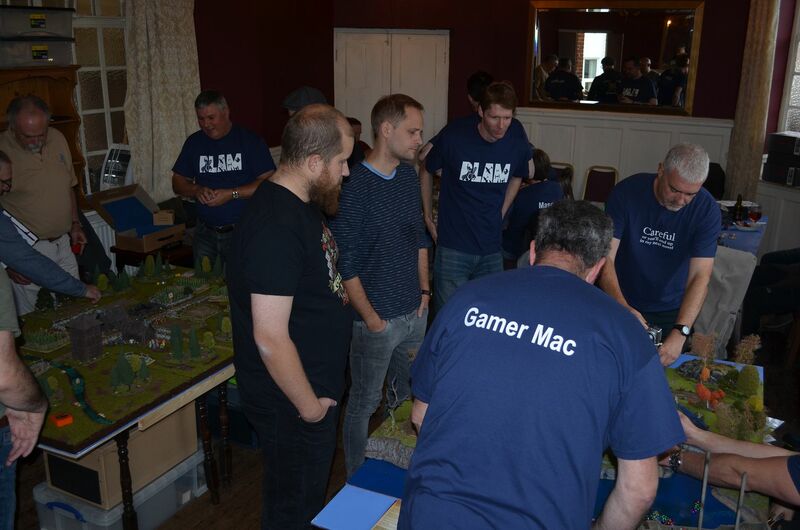 We had a great game, it flowed quickly, delivered a result that most players felt was in-keeping with the period and was perhaps most importantly incredibly easy to pick up for those unfamiliar with the other games in the stable. 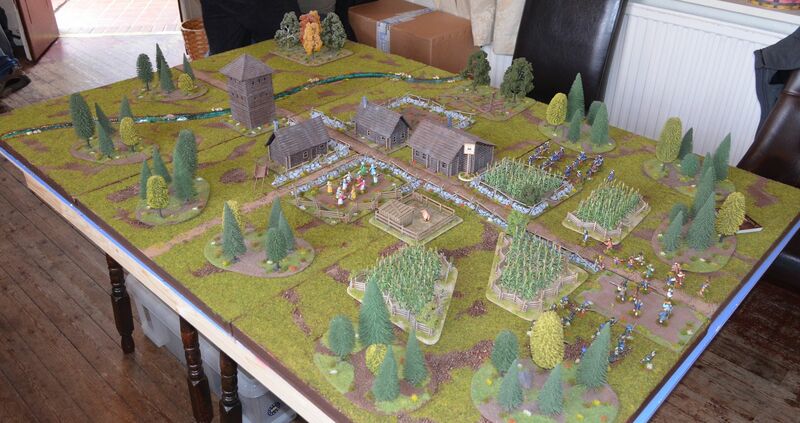 Whats up next – well given the table is set up and the forces can be rearranged we are going to fight the same battle using Black Powder. It will be interesting to see how this plays out. 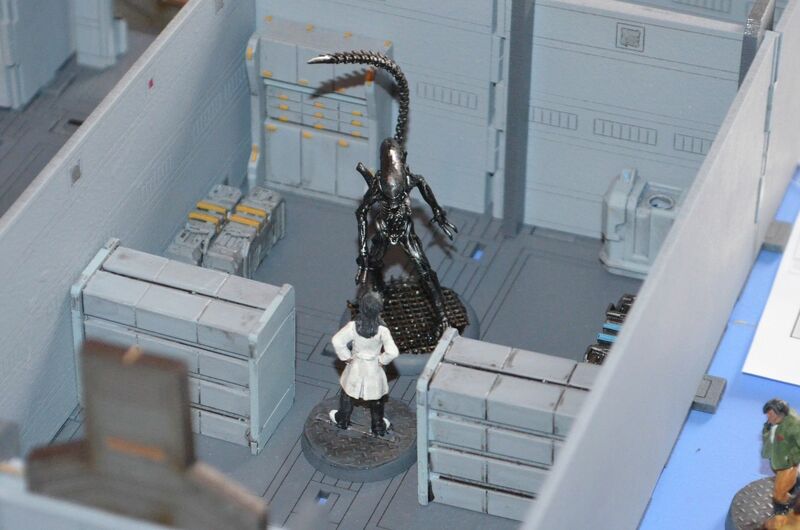 This coming Monday the shed is going to trial the new Osprey rulebook titled The Men who would be Kings written by Dan Mersey. This author is the same one who wrote the successful Lion & Dragon Rampant series. Post game I'll put up a report and how they played however reading through this set you can see it shares the same heritage as the previous two but with a few major modifications. 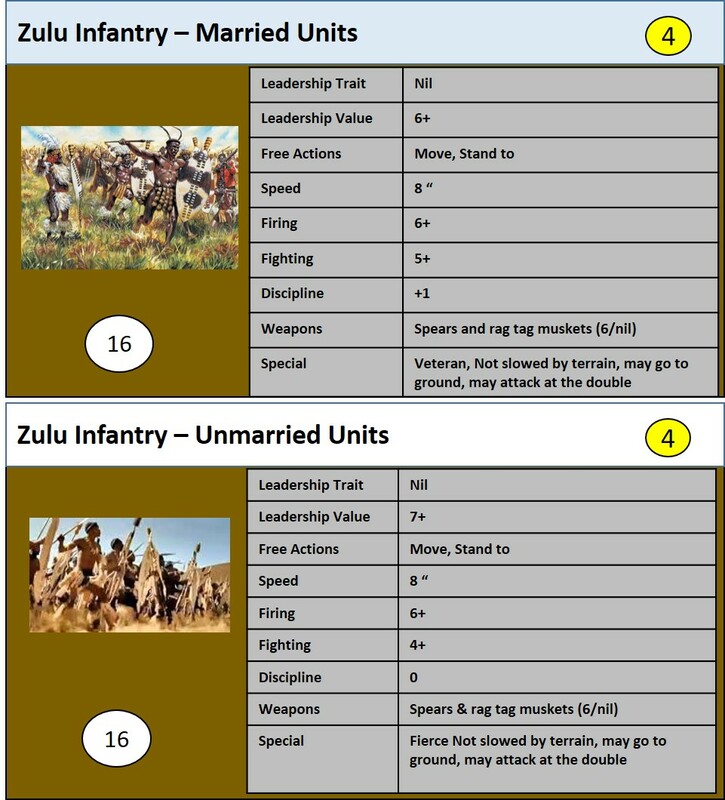 The first is that all units have a standard set of actions which they don't have to test for...in other words infantry get to shoot if they can see a target, zulus get to move and attack. In the earlier games once a unit failed the entire army failed. The second main change is the adoption of leadership values for each unit. 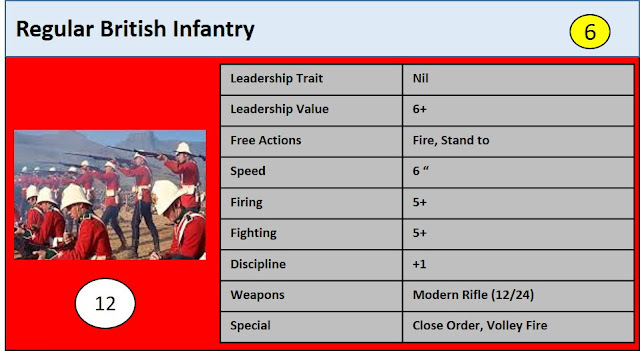 There's a nice table to build the leadership value and this is great if you want to fight a battle with only a few units. I am going to introduce a simple modifier to this...all units will have a standard leadership score according to my perceived wisdom. Why...well my game is going to have six players and at least 90 points aside. Having separate rankings for each unit of the same type is going to be a nightmare. I do however like to have generals and officers on the table. Each brigade/impi whatever will have one leader - this will have a command radius of 6" and add +1 leadership to any unit within this area. He cant be everywhere but could influence the game. Unit cards are a great way of getting the players to better understand and control their troops. 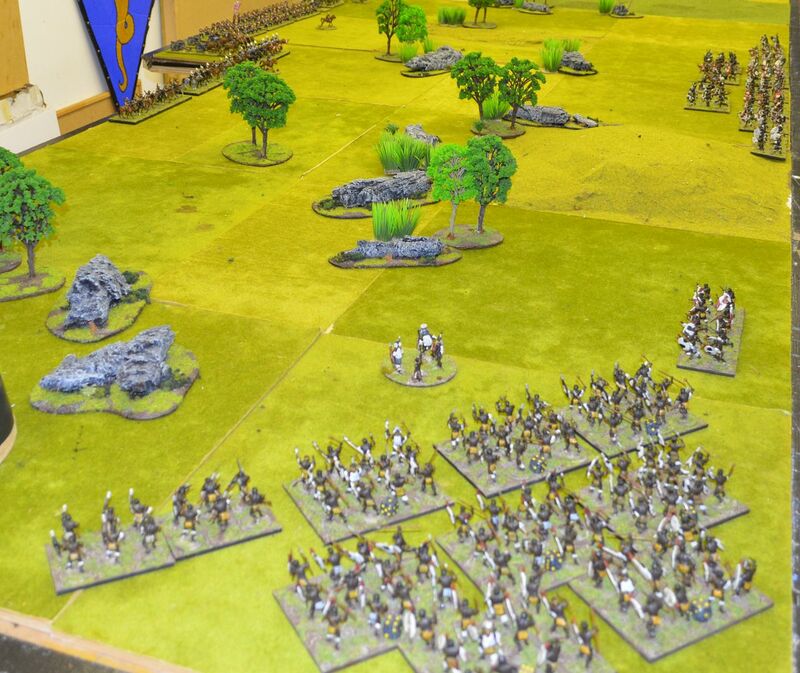 They speed the game up and can be used if in sufficient quantity to create random armies. My aim with the The Men Who Would be King ruleset was to get all the pertinent data onto one card. One face containing all the unit info the other general rules. These have been produced using power point. I'll print these all off for monday's game and if all the relevant data is there and works I'll laminate them up. 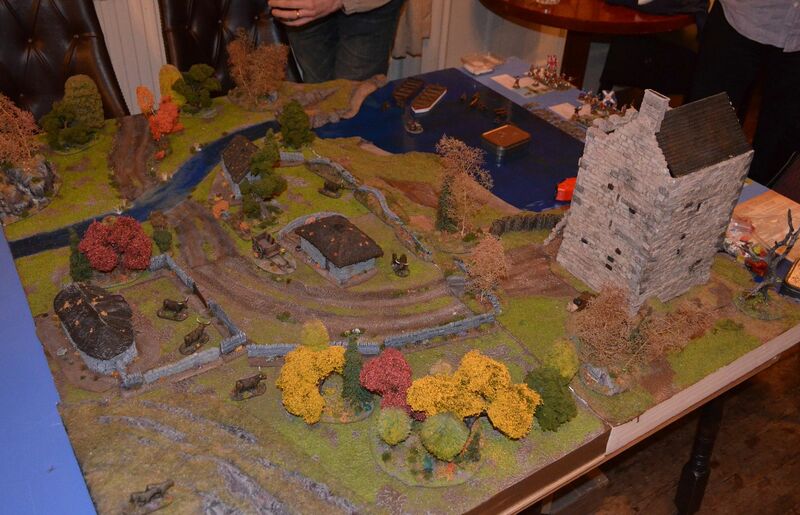 Last weekend saw the ninth BLAM take part in my local pub in Surbiton. 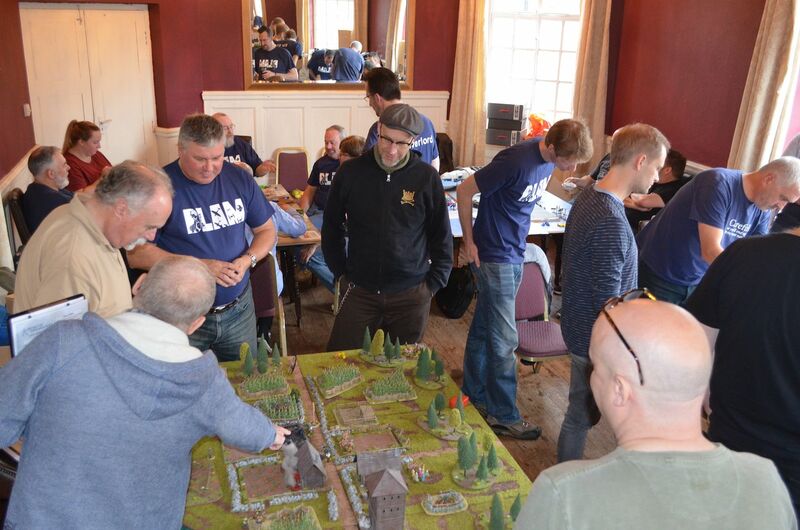 BLAM is an anacronym for British Lead Adventure Meeting. 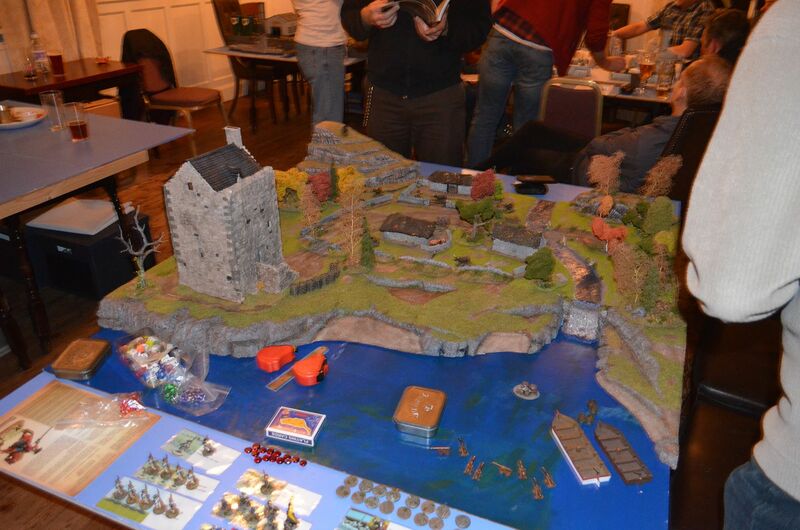 Its an annual gaming event brought together by some of the key British folks on the Lead Adventure Forum. 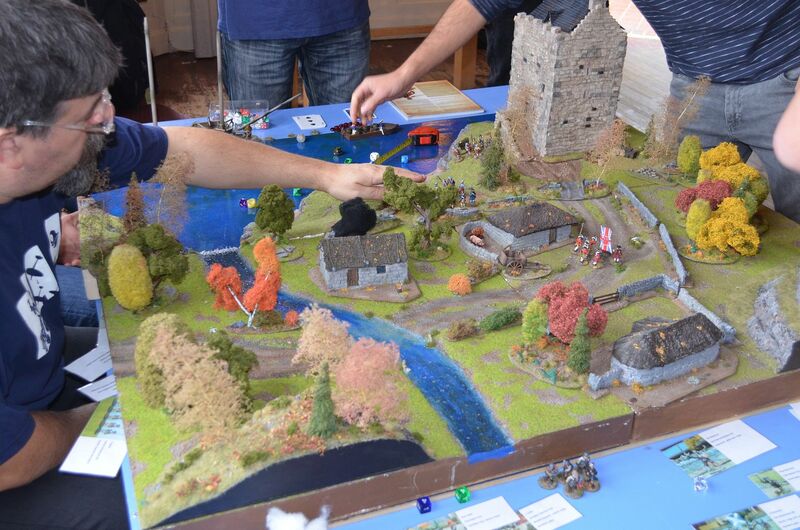 Each year some 30 individuals get together for three days of gaming, beer and food. 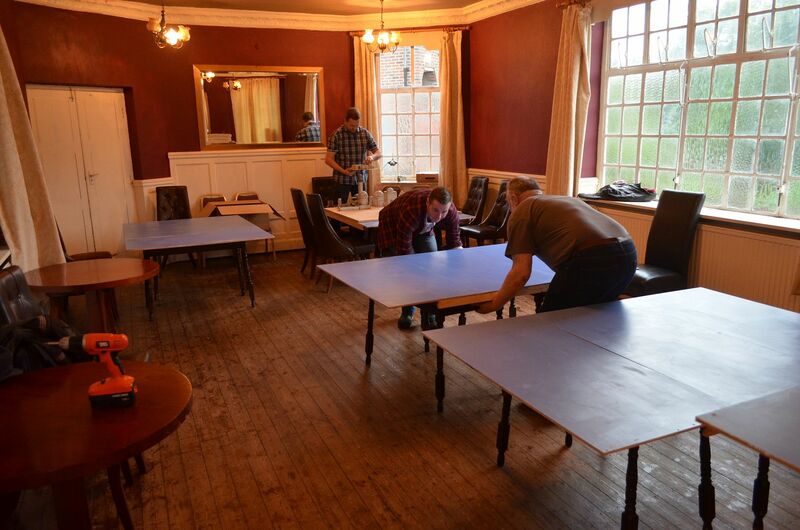 Its all very hospitable and indeed the social aspect is probably the best feature of the event. I have been involved in the hosting of this event (along with Mamalute and Captain Blood) for the last three years since it moved to Surbiton from Woking. The meet starts on a Friday morning and goes through to the Sunday. This year we welcomed guests from afar as field as Germany, Scotland, Denmark, Ireland and Wales. 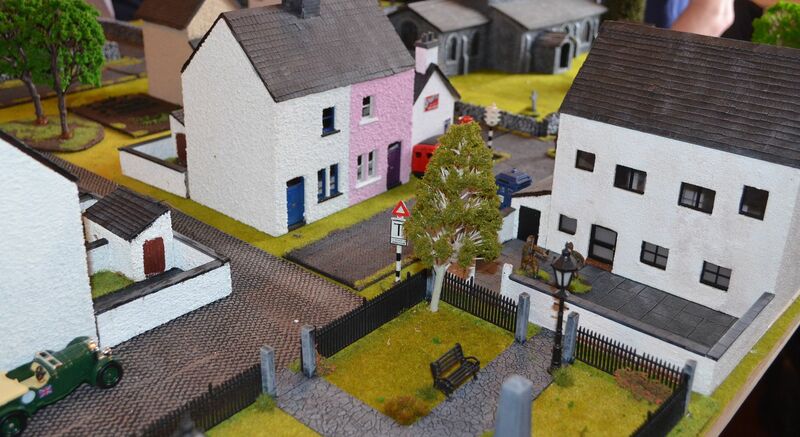 Most have been before but each year we get a sprinkling of newbies to partake in the event. The only proviso to coming (aside from a cap on the numbers) is that you are a frequent and active contributor to the forum. If you want to learn more drop me a private message on the forum and providing you meet the criteria above we can open up the 'special boards' and introduce you to BLAM !